With the help of a correspondent to my blog I was lucky enough to get hold of an early 80’s ‘Stylophone’ from the Soviet Union. Entitled the ‘Gamma’, I’m told it was made in the city of Chernivtsi, a part of the Soviet Union now in western Ukraine. 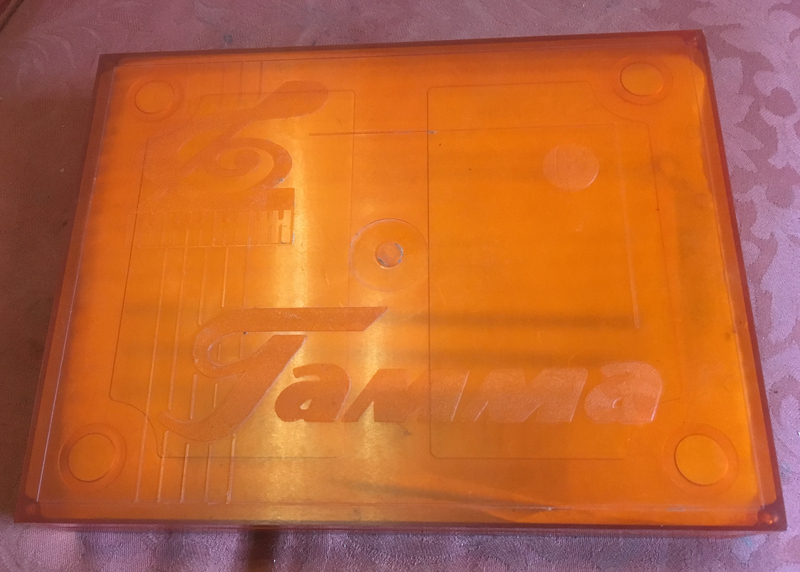 Larger than a Dübreq Stylophone, it came in a neat plastic box measuring about 25x20x5cm. 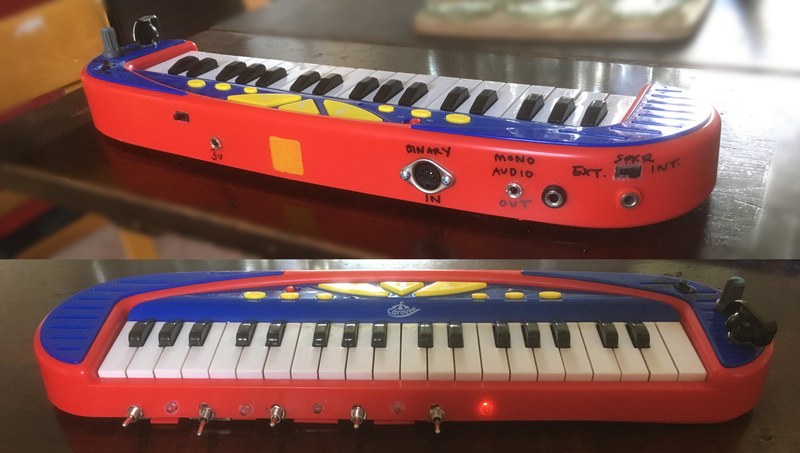 Inside, the Gamma Stylophone itself has a 20-note keyboard at the front, a stylus – more complicated than a Dübreq Stylophone stylus – on a twin lead, a volume control on the left-hand side, and a speaker in the top left-hand corner. 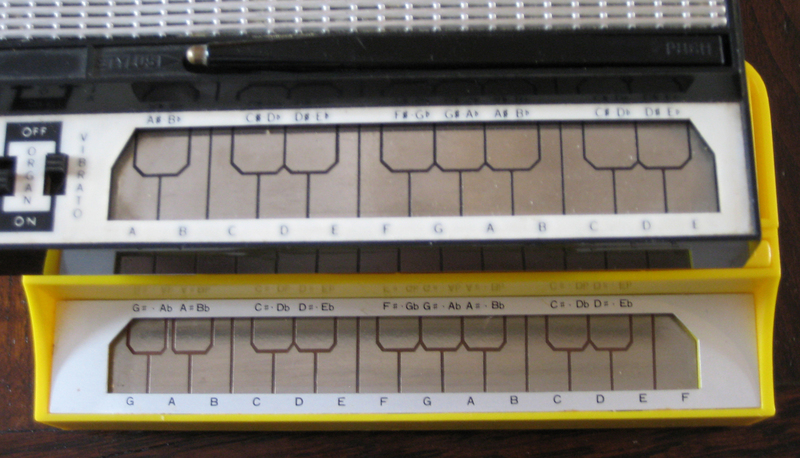 A coloured label indicates the notes of the scale represented by each section of the keyboard. 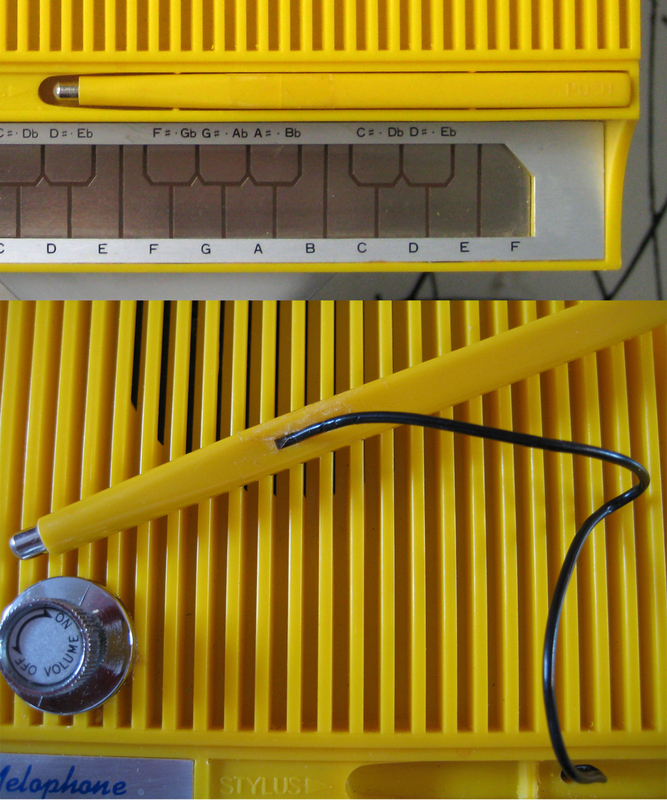 The stylus, as mentioned above, is more complicated than the Dübreq Stylophone stylus in that it includes a combined press and slide switch. 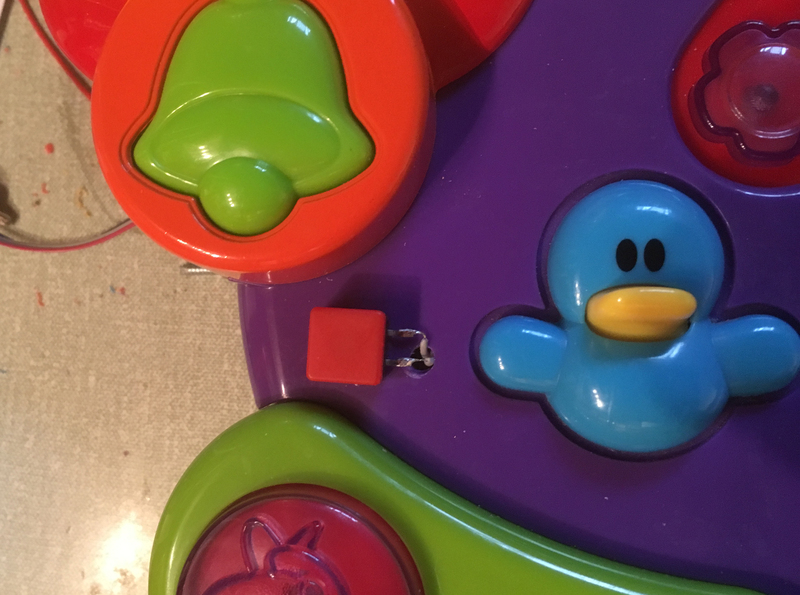 It turned out that the press switch had to be pushed for the stylus to work; the slide switch turned the vibrato on or off. Helpfully, my correspondent had cleaned the instrument before sending it, so there wasn’t a lot for me to do! I opened the case – just 4 slot-headed screws underneath – and examined the insides. 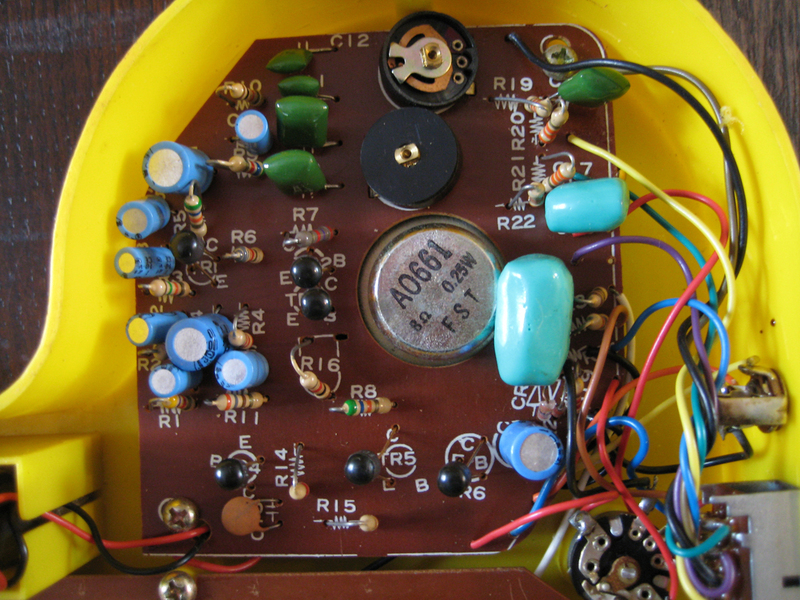 The circuit board was attached to 4 mounts on the base; the speaker had 4 mounts on the front. Turning the circuit board over, I could see the components and the layout. Everything seemed neat and well made, with a good solid loudspeaker. 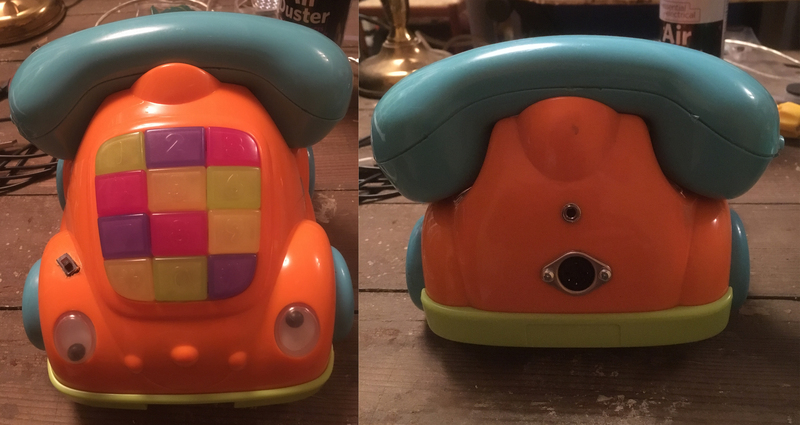 I removed a little more of the disintegrating foam – and replaced a speaker wire, which I had inadvertently detached – and then turned to the power cables. The battery fittings had been removed, but I could see from the booklet which came with the instrument, that these had been designed for a pair of Soviet-style 4.5v batteries: my correspondent explained to me that these were similar to a group of three 1.5v batteries – not unlike the kind of thing we used to have inside cordless phones – but which were, in any case, now uncommon. 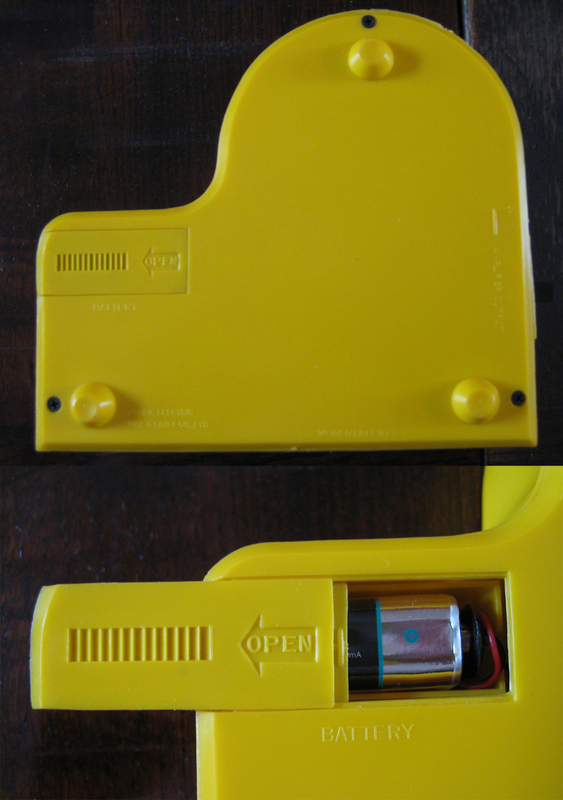 I just added a PP3 battery clip, similar to the type one would find in an old-style Dübreq Stylophone, which worked fine. I hadn’t intended to ‘circuit-bend’ this device, but I pondered on adding an on/off switch, as there isn’t one in the original design. I attached the battery and tried it out. 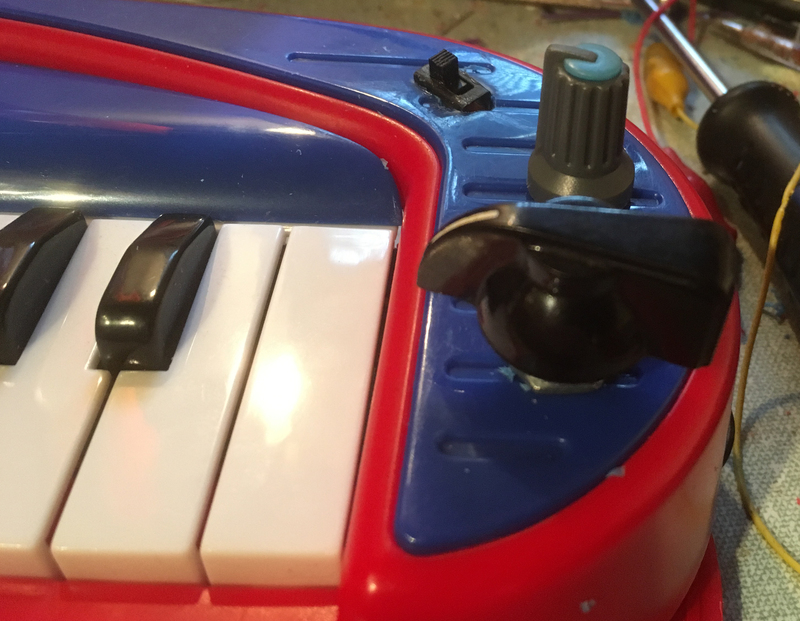 The push switch needed a bit of attention – a few squirts of contact cleaner helped – but all the notes sounded perfectly, and the vibrato turned on and off. 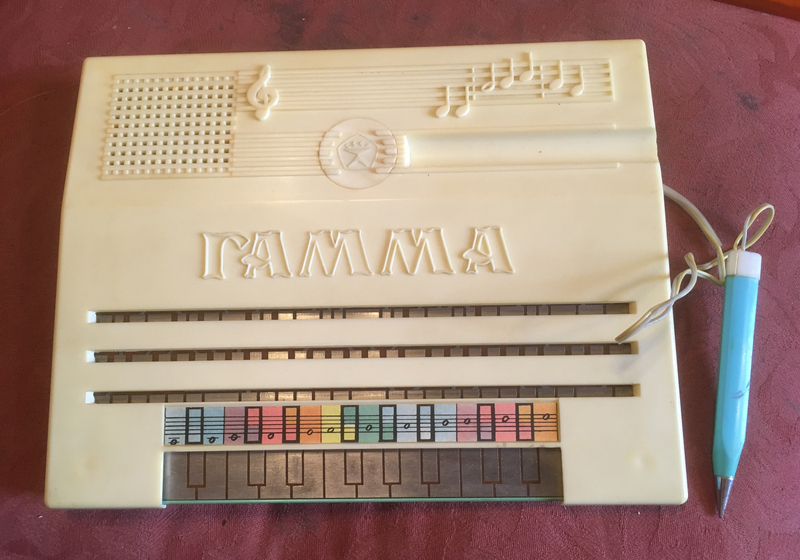 I wasn’t able to check that the notes were in tune, and there’s no fine tuning control, which you would find on a Dübreq Stylophone, but I’ll look into that later. 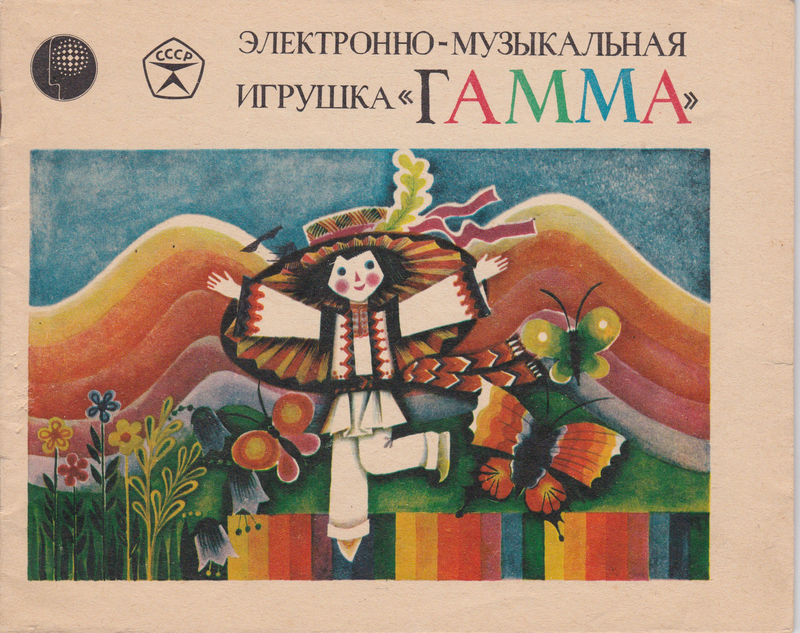 The booklet that came with the Gamma Stylophone was delightful – the paper and printing quality weren’t high, but the illustrations were beautiful and the colourful instructions on how to play the many songs were attractively set out. Read the Gamma Stylophone Booklet. I’m told that Chernivtsi is in the region of Bukovina, which lies partly in the Ukraine and partly in Romania, and that the costume of the dancer in the picture is from this region. The serial number in the booklet and on the back of the instrument is ‘304’. It is normal, apparently, for these instruments to have 6-figure serial numbers, so this could be a very early example. There is no circuit diagram in the booklet, but this is said to be unusual in the Soviet era when it was common for these to be included. Here’s a short video of me testing the Gamma Stylophone. You can see from this clip how the stylus switches function – and also what the 3 extra slots are for! 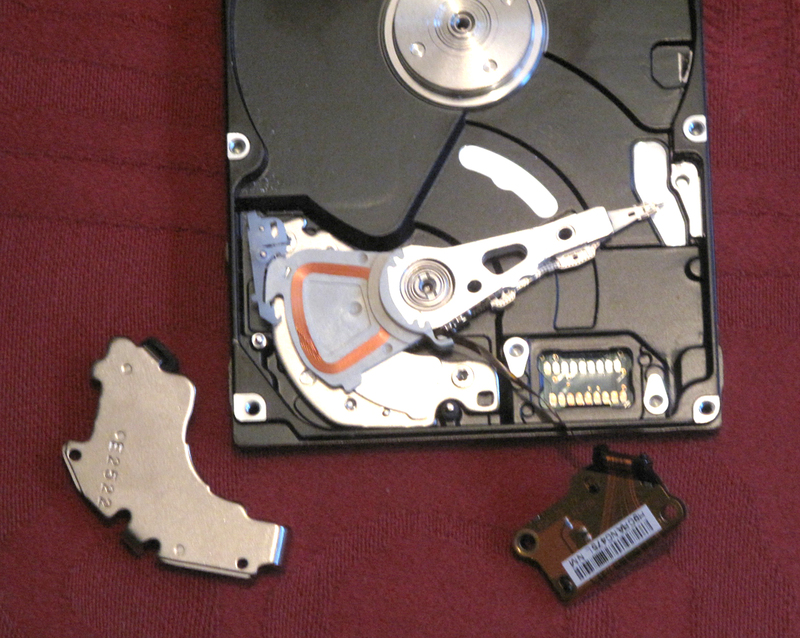 Note that in the following post I’m describing taking a hard drive apart in order to reuse some of the parts, but have no intention of putting it back together, or making it work again as a hard drive! I’m sorry the PCB side is rather blurry, but I was less interested in that than what was inside. 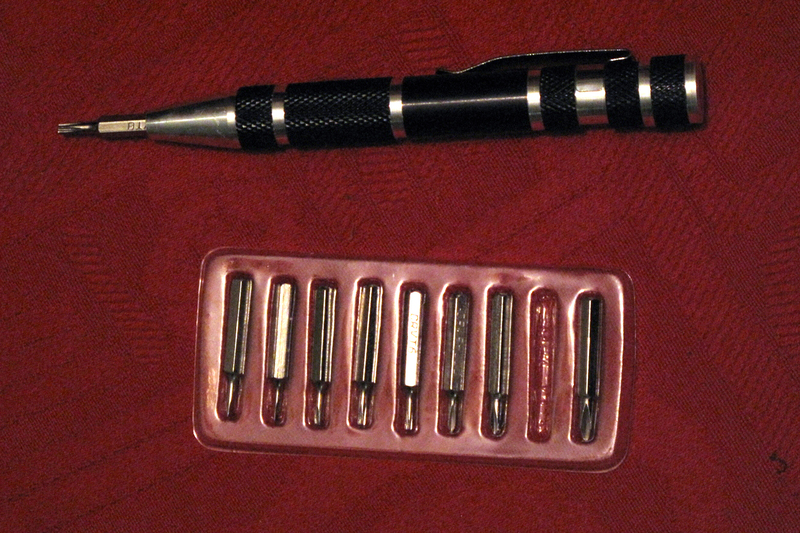 I also needed a large flat-bladed screwdriver, which I used two or three times. If you’re going to do the same, you may find a few differences in the details – type and positioning of screws, differently shaped fittings, and so forth, but the principles should be the same. I first removed the circuit board, and put that aside. Turning it over, you can clearly see in the first picture the 6 screws round the edge of the ‘lid’ which needed removing. Having taken these out, it seemed that the top was glued in place as well as screwed, so I went round with the large screwdriver, prying it open. This almost freed it, but it was only after still experiencing considerable difficulty in getting it completely open that I realised there must be another screw somewhere in the middle, under the label. I scraped away the label until I found it and took it out. The arrow shows where it was. I was then able to take the lid right off and expose the inner workings – of which there aren’t actually that many. 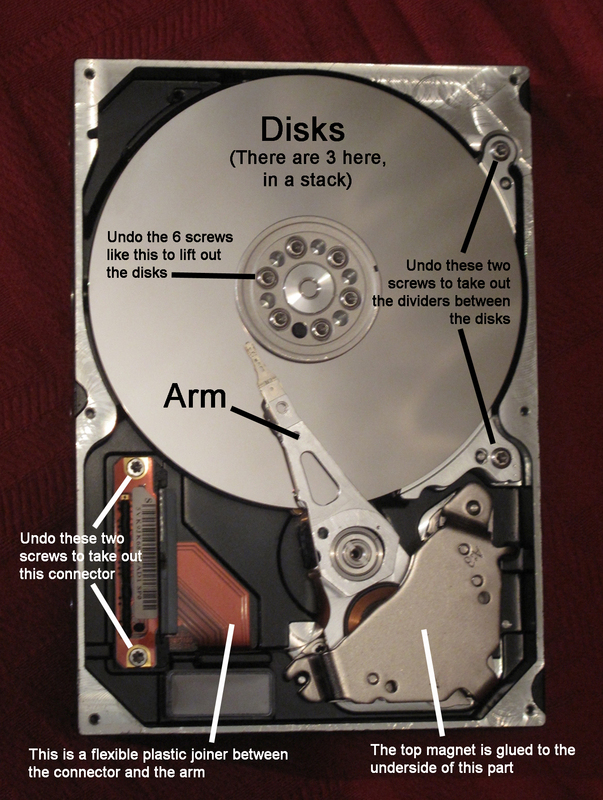 The picture shows the disk or disks, one on top of the other, like a stack of pancakes – except there are gaps between them, and the arm is actually several arms, one for each disk; the arm itself with the delicate heads on the end which read the data from the disks, and with its other end moving between two magnets (not visible at the moment); and finally a flexible plastic multi-way ‘cable’ which joins the arm – and some small circuitry on the arm – to a connector. This would have poked through a gap in the case to connect to the circuit board on the other side. 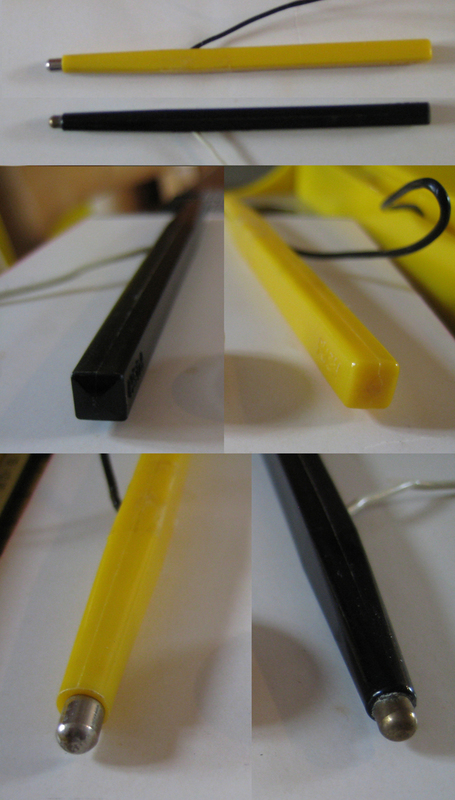 Later on, connections will have to made to some very, very tiny points on the arm, and it’s going to be a lot easier to trace these points back to the connector, so its important not to damage the plastic cable. The connector could be poked out from the other side, once it two fixing screws had been removed. 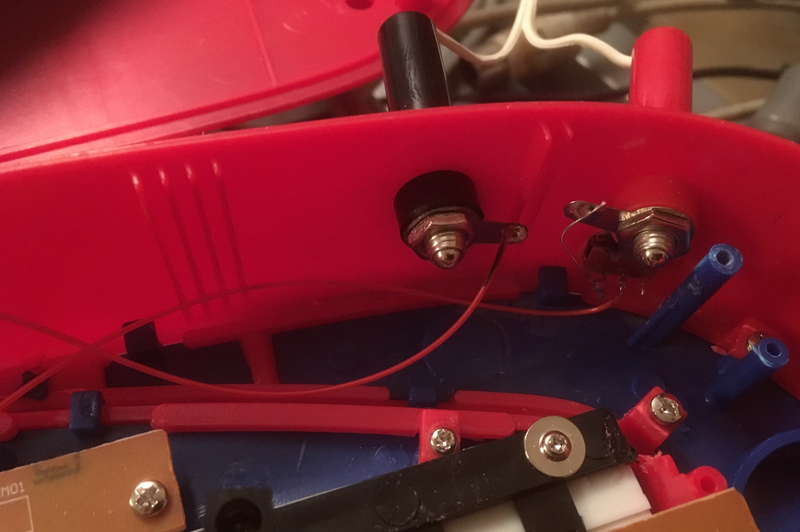 The fitting obscuring the back end of the arm wasn’t – in this model of drive anyway – screwed in place, it was just slotted on some pins and just needed prising off. 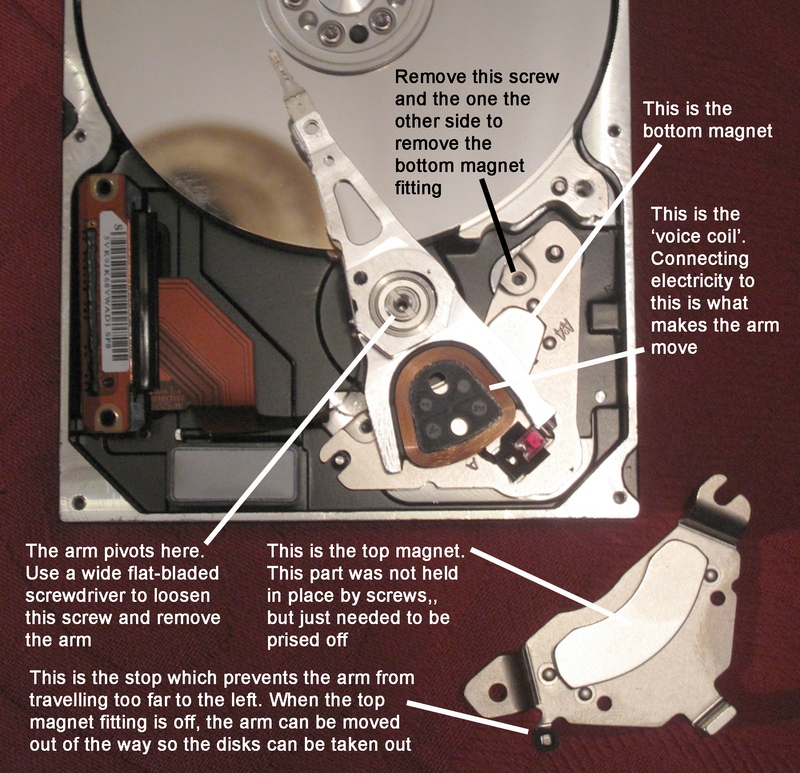 I believe the magnets in hard drives are made of neodymium. This is classed as a ‘rare earth’ (although it’s isn’t actually any rarer than, say, copper) and makes very strong magnets. Just be a bit careful as you remove them, and think where you’re going to put them down as you can be surprised at how firmly they grab lighter metal objects. Once the top magnet is off, it’s possible to move the arm out of the way and get the disks out. This involves removing 6 screws around the centre (on top of the motor) and two screws at the side. the disks and the various fittings associated with them all come off in layers. 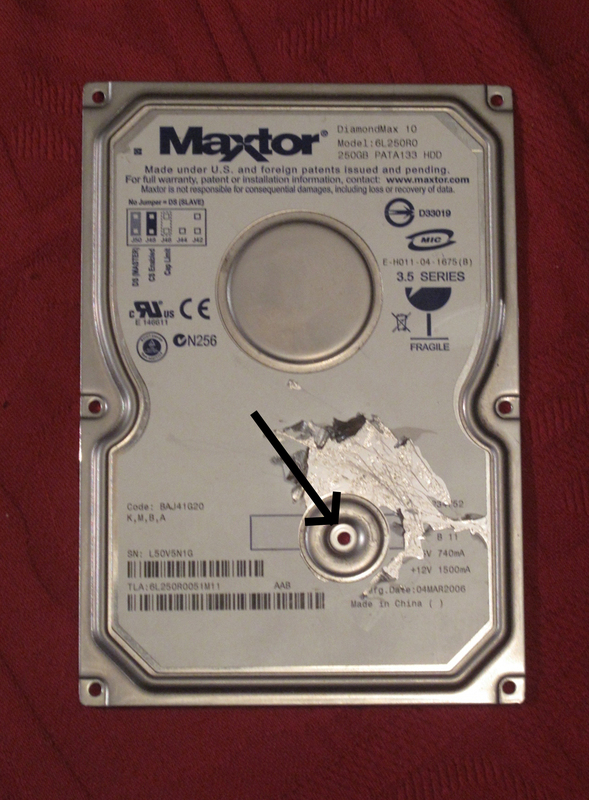 The disks – there were three of them in this drive, look very much like CD’s, with a large hole in the middle, except they’re made of metal. I put the disks carefully to one side – I had an idea they might be good for chimes or cymbals – and focused on the arm. With the top magnet out of the way, it was possible to see the so-called ‘voice’ coil’. 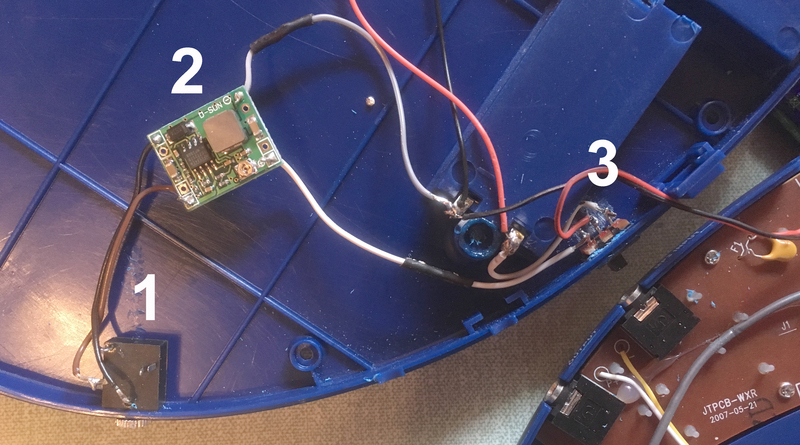 Two impossibly tiny wires connected the voice coil with the arm actuation circuitry, and to test that the arm was working I needed to attach a battery to these wires. In the end these wires were just too small, so I traced them back through the plastic cable to the connector, where it was slightly easier to get at them. Attaching the battery leads to the two points produced nothing at 4.5v, but at 9v there was a loud and satisfying clunk, which showed that the arm was working fine. 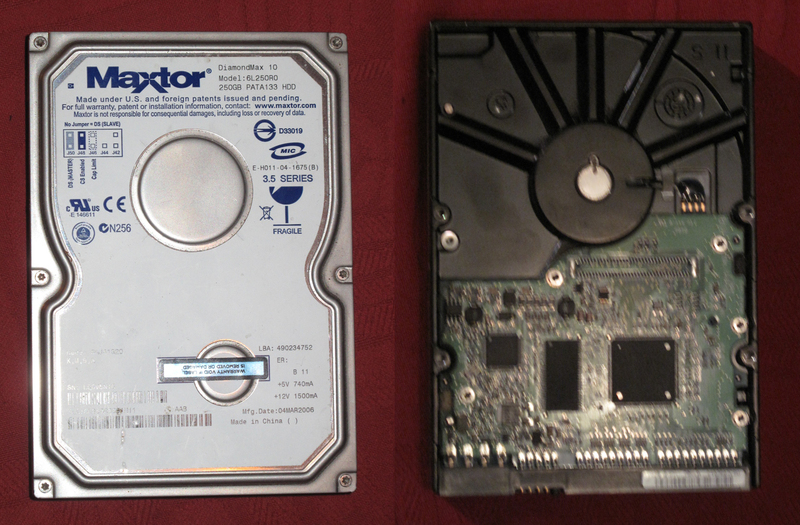 The procedure with the next disk I worked on, a smaller 2.5″ was exactly the same. The top came off once I had removed the 6 visible screws and the 7th screw hidden under the label. 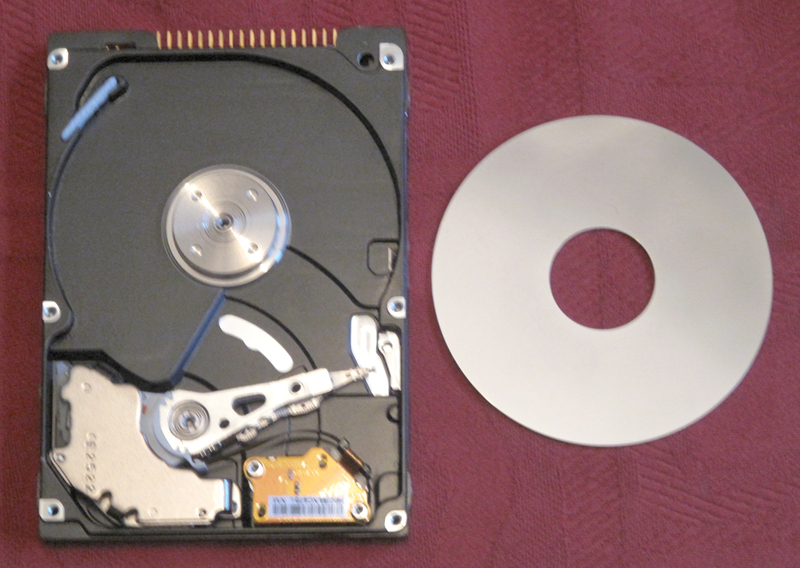 I needed a smaller Torx/star screwdriver – a size 5 or 6 – for this disk compared to the other one. 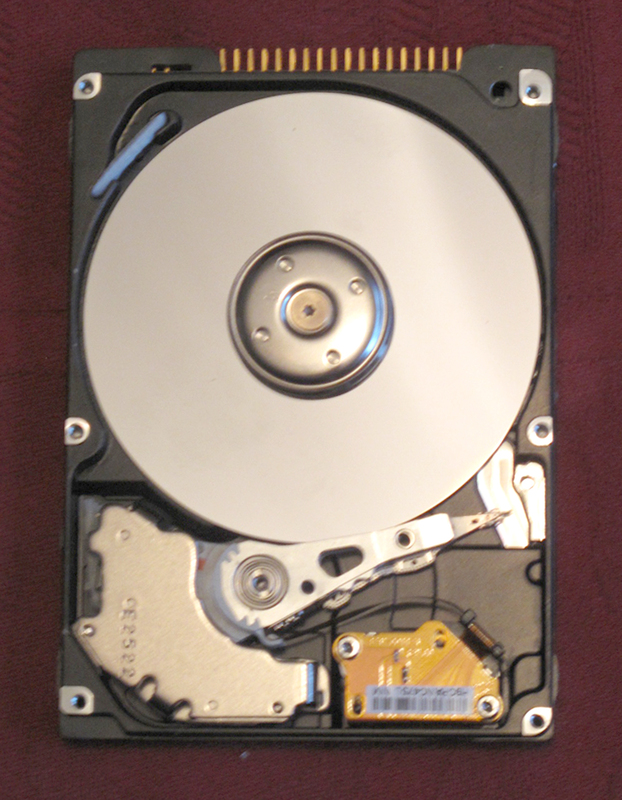 A single screw in the middle of the motor housing allowed the disk to come out. Removing two screws freed the unit in the bottom right, which connected the arm with the circuit board on the other side. 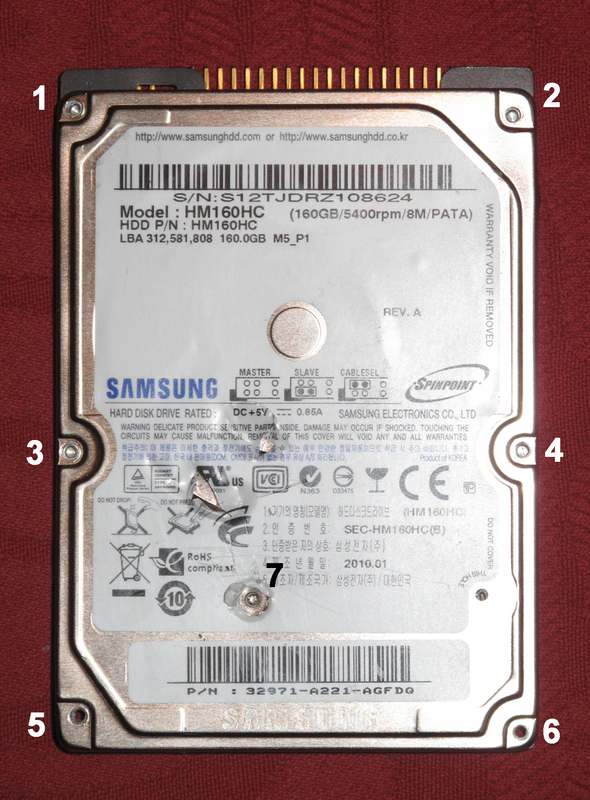 I prised off the top magnet (bottom left), just to make sure the construction was the same as the 3.5″ drive – which it was. I replaced the magnet and tested the drive with a battery. I’d already removed a plastic retainer on the right, by the heads at the end of the arm; I also had to remove the plastic piece which you can see on the left, which was restricting the arm’s movement. 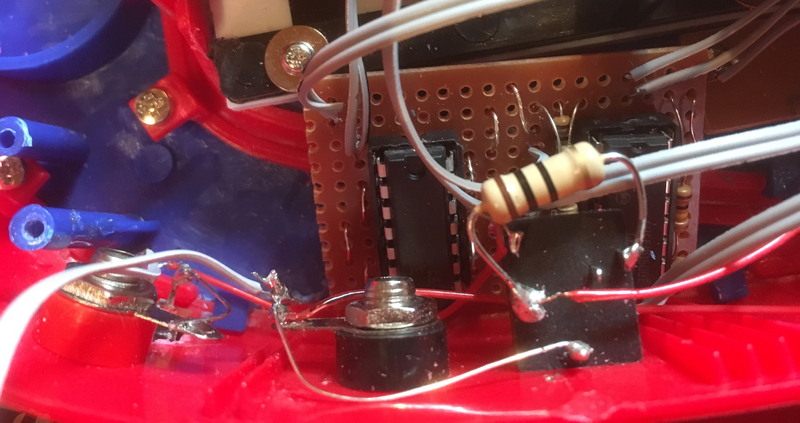 However, once I had done this, applying 9v to the appropriate pins on the connector reliably operated the arm. 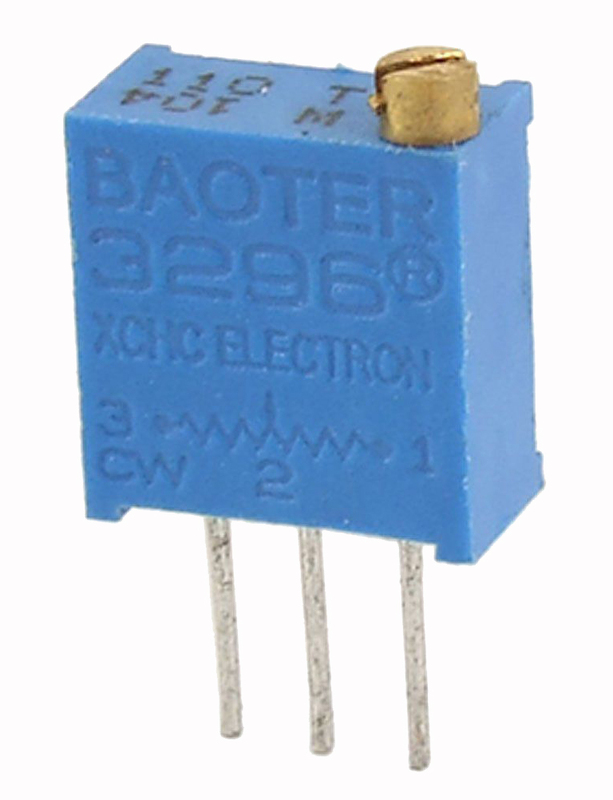 In fact, this smaller mechanism would also work with 4.5v, which was a useful discovery. 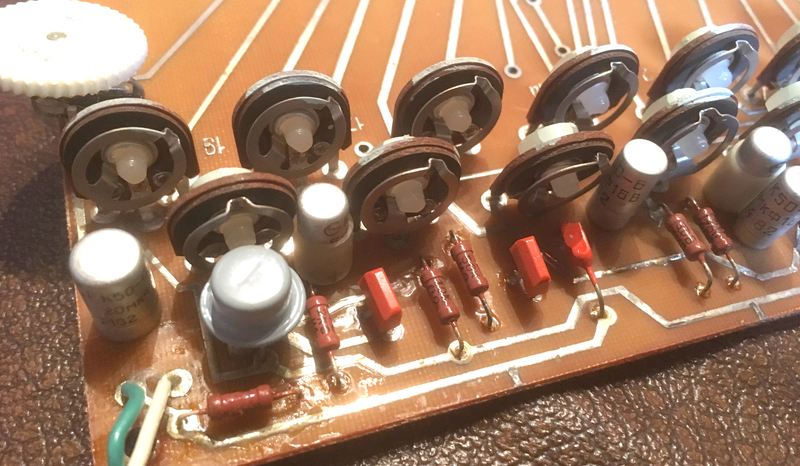 If parts of the circuitry which would operate it had to be quite low – say, 5v – it could be handy if the arm would also work at the same voltage. So, I had verified that an arm from an inexpensive broken hard drive could operate as an electrically-operate striker, like a solenoid; that arms from both 3.5″ and 2.5″ drives would work; that the 3.5″ drive arm would operate at 9v; and the 2.5″ drive arm would operate at 4.5v. It will be some time before I get round to the next part of this project, but the next thing will be to see how the arms could be set up to operate outside the hard drive housing. The Alien Choir wasn’t a device I particularly wanted to circuit bend- the alien voices it makes are fine as they are! – but I wanted to do a couple of things to make is easier and better to use. The Alien Choir is one of the ‘Finger Beats’ series. 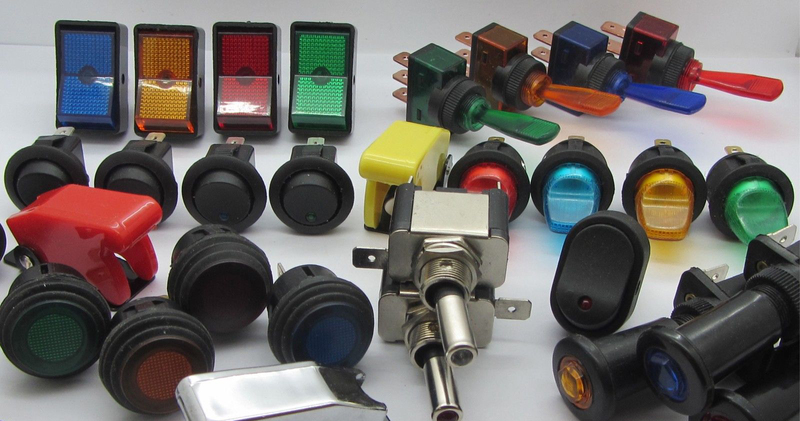 These are recognisable by their distinctive design, and are all operated in a similar way, using light finger pressure in certain places on a colourful illustration on the front. 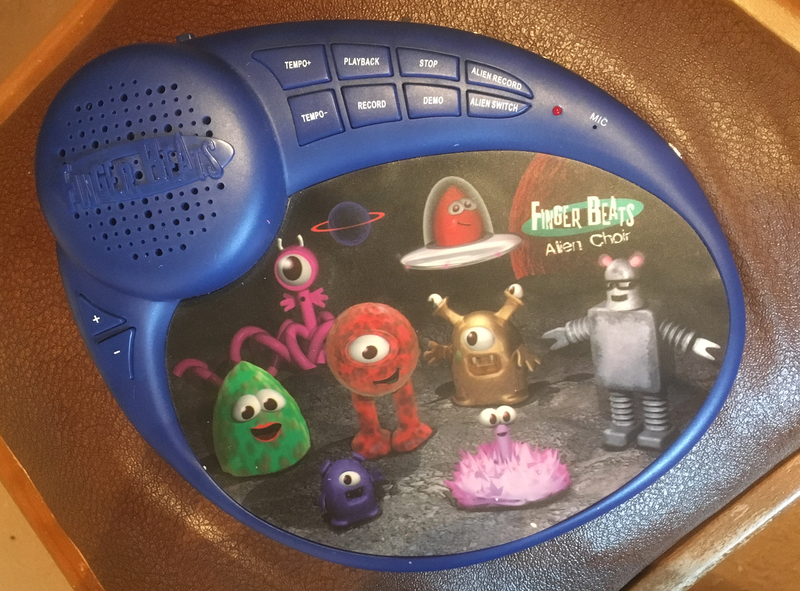 I don’t have an instruction book with mine, so it’s not clear that all of its functions are working – in particular, recording samples with the built-in microphone – but it makes 8 excellent alien voice sounds. The volume of the sounds can be turned up or down with the ‘+’ and ‘-‘ buttons on the left-hand side. 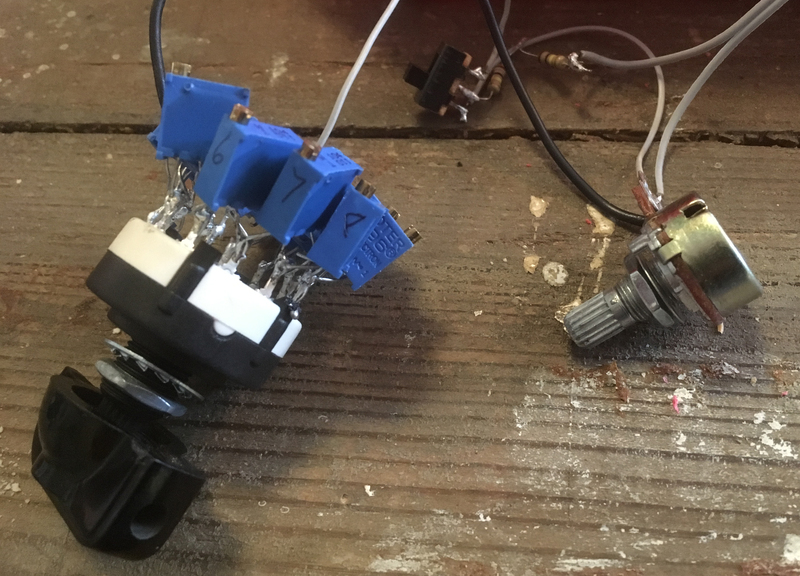 First of all, although 3v isn’t an odd or unusual value, I decided to add a socket and dc converter to allow the device to be powered by a mains adapter or larger – e.g. 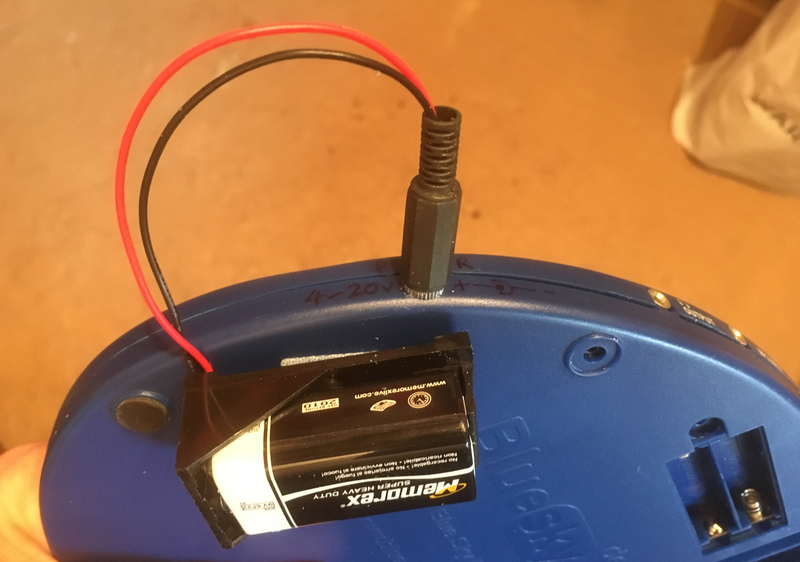 9v – battery. To this end I also added a small square of velcro to the back, as I had with other instruments before, to allow one of my 9v battery holders to be attached. 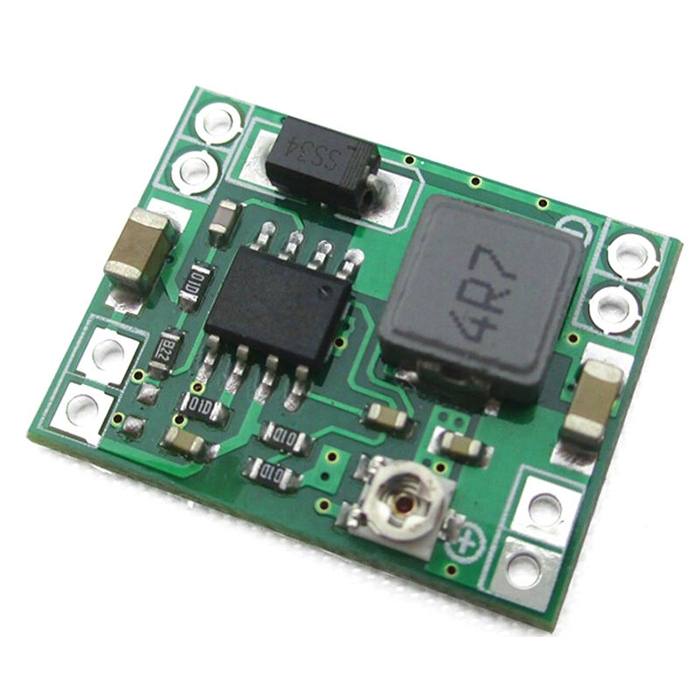 The dc converter was a small and inexpensive (less than 50p) module, which didn’t need any additional components, just an input voltage from 20v down to about 1v higher than the desired output voltage. The output voltage is set by means of a small trimmer on the board. In this case I found that the required voltage, as measured on my multimeter, needed to be a little lower (about half a volt lower, in fact) than the anticipated 3v in order for the circuit to work smoothly. I don’t know if this is something specific to the Alien Choir, a difficulty in measuring the voltage precisely, or what. 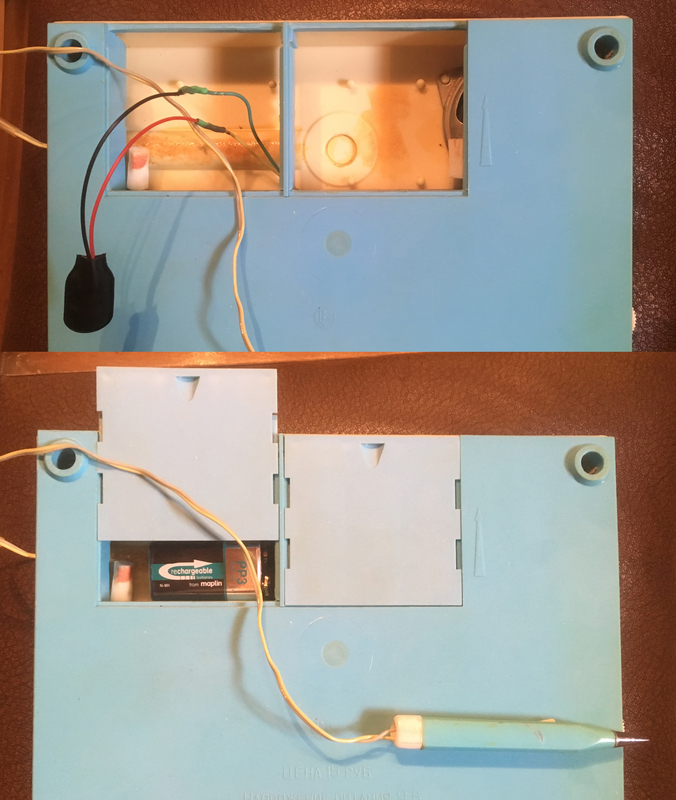 Inside the device, I added a switch to choose between the battery or the external socket. In the following picture 1 indicates the socket, 2 the dc converter and 3 the switch. 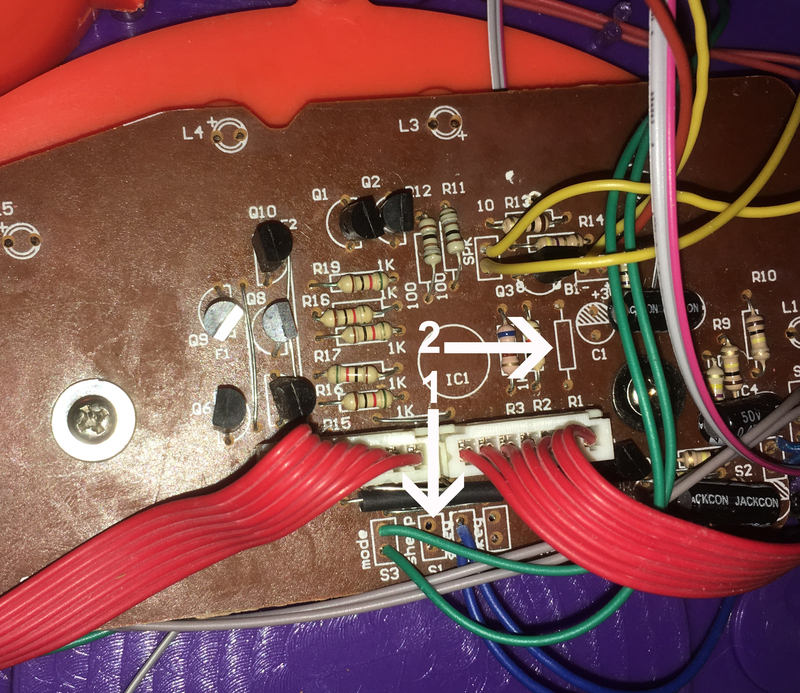 The device has a 3.5mm audio out socket (and an audio in, in fact, as can be seen in the lower right-hand corner of the picture above), but I decided to add banana sockets for connection to one of my external speakers. This always produces a much better sound than the small built-in speakers these devices are fitted with. 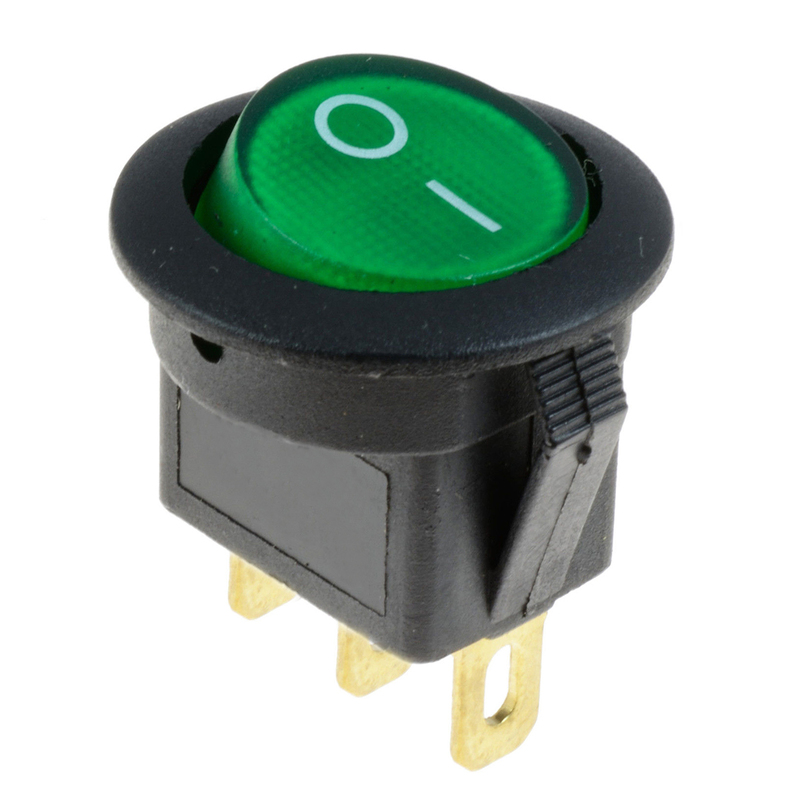 The small switch on the right selects either the internal or external speaker. I hope this will be a useful – and certainly attractive – addition to the ‘Outer Space’ section of my instrument collection. 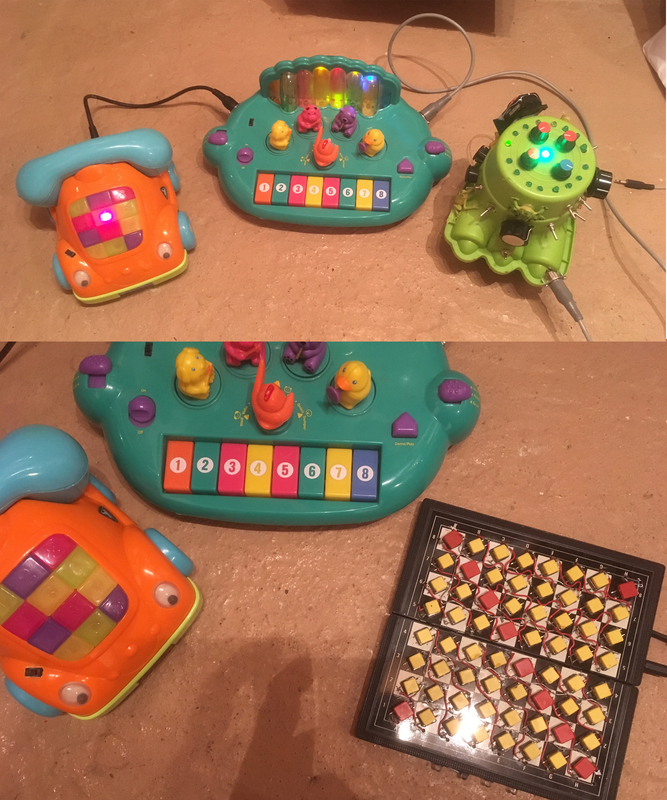 This project came about as I was looking through my collection of electronic toys for additional devices that could be controlled by the Bigfoot sequencer or the Chessboard keyboard. 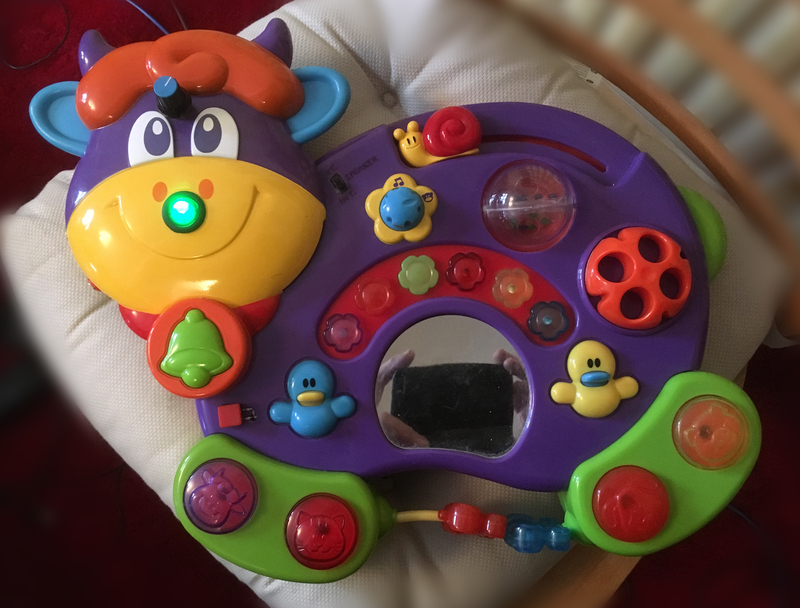 I don’t know if ‘Animal Band’ and ‘Telephone’ are the correct names for these toys, but they are sufficiently descriptive to identify them amongst my various devices. 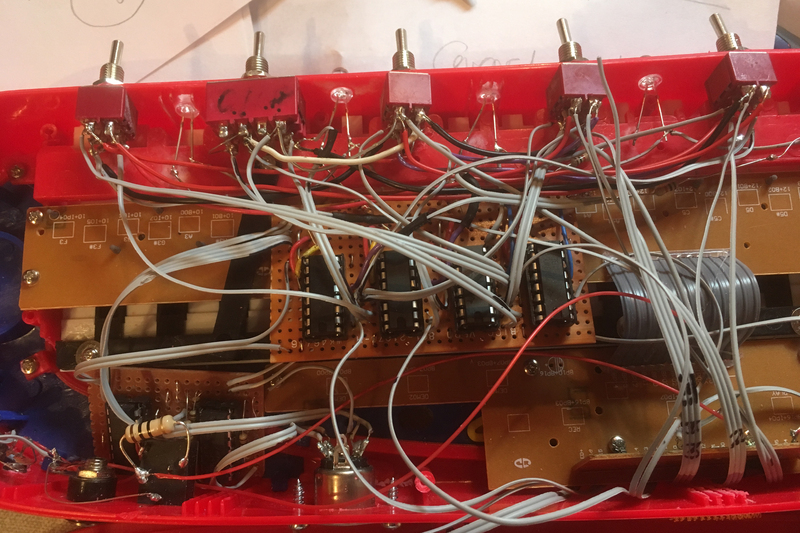 Both the Bigfoot and the Chessboard encode the 15 pitches (2 octaves) they can produce into 4-bit binary numbers so that they can use standard 5-pin DIN connecting leads – the same as MIDI leads – rather than more complex multi-way connectors to control sound-making instruments. 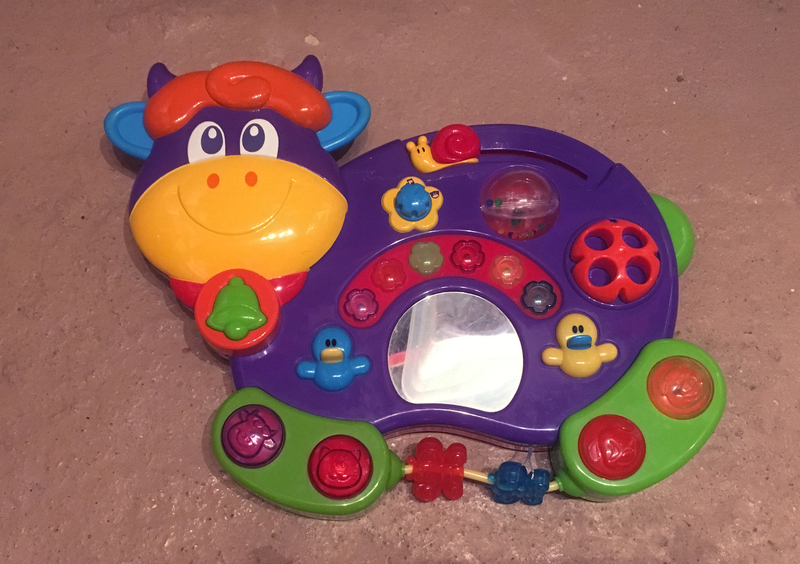 I came across two devices, which were rather limited in that they played only a one octave scale; but it was the same scale – B major – and one of them had not only small animal musicians who moved as the notes were sounded, but was also capable of playing a scale with various animal noises. For some reason, this scale turned out to be A major, but this was only a minor inconvenience. The additional electronics required would be similar to those in The StyloSound, the main thing being a circuit to convert the binary number input from the Bigfoot or The Chessboard to the individual notes of the scale. Both the devices would need one of these. At the beginning, the input passes through a non-inverting buffer. (There are 6 connections from the input to the buffer in case a later plan for operation via MIDI is implemented, which is designed to use 6 bits. For the time being, only the first 4 are being used, the other 2 remaining unconnected). 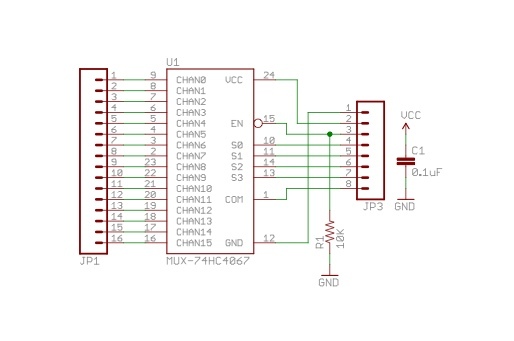 The purpose of the buffer is to reduce the incoming signal level (which, from both the Bigfoot and the Chessboard, is at 9v) to 4.5v, the voltage of the Animal Band. The 4050, unusually, is able to deal with an input signal which is higher than its supply voltage, which makes it ideal for this purpose. 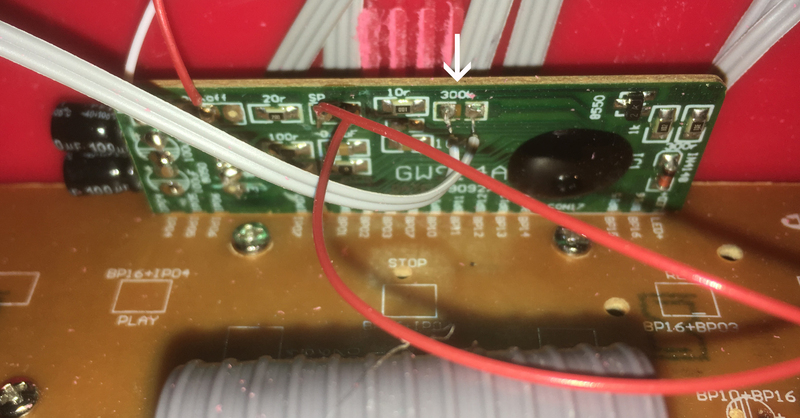 To avoid silences – Bigfoot produces 16 notes, the Animal Band produces only 8 – the output pins for notes 9 – 15 are connected to the pins for notes 2 – 8. Pin 15 is brought out to an SPDT switch. 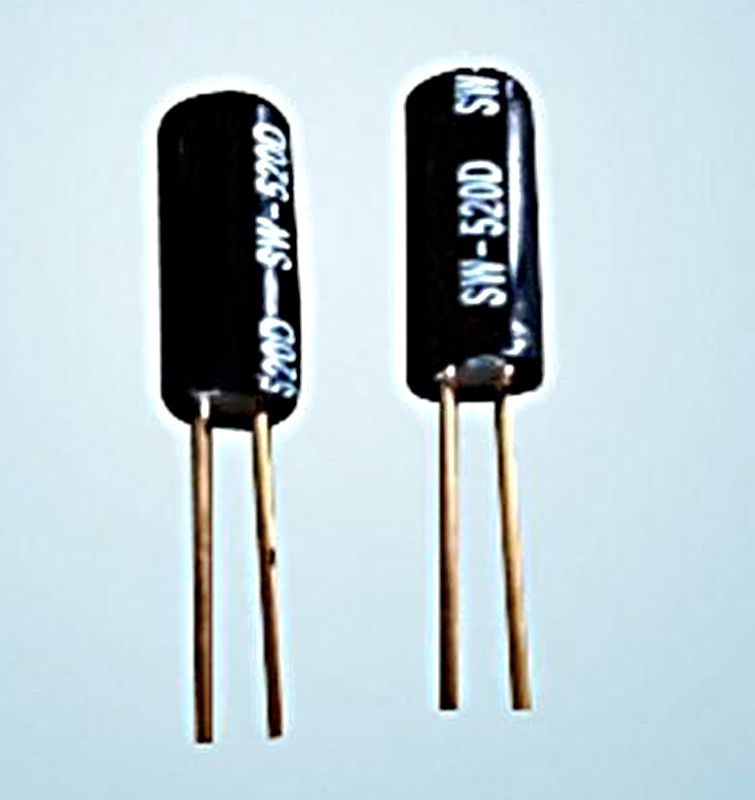 When connected to +v, the 4067 is turned off; when connected to 0v, it is turned on. The Telephone would have a similar switch. In this way either instrument can be set to work or not work without disconnecting the power. 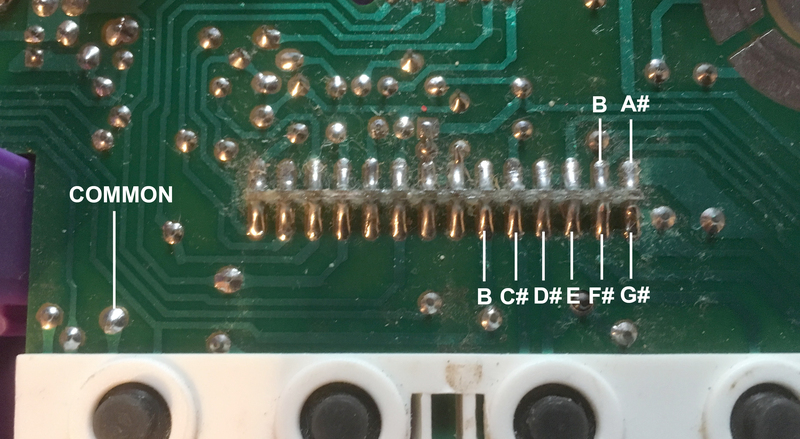 To find exactly where to connect the Common and output pins of the 4067 I needed to search inside and test different points on the printed circuit board. The important sections are marked. (Normally the LEDs are pointing upwards, but I was in the process of examining them when I took this picture and had unscrewed the circuit board on which they are mounted). 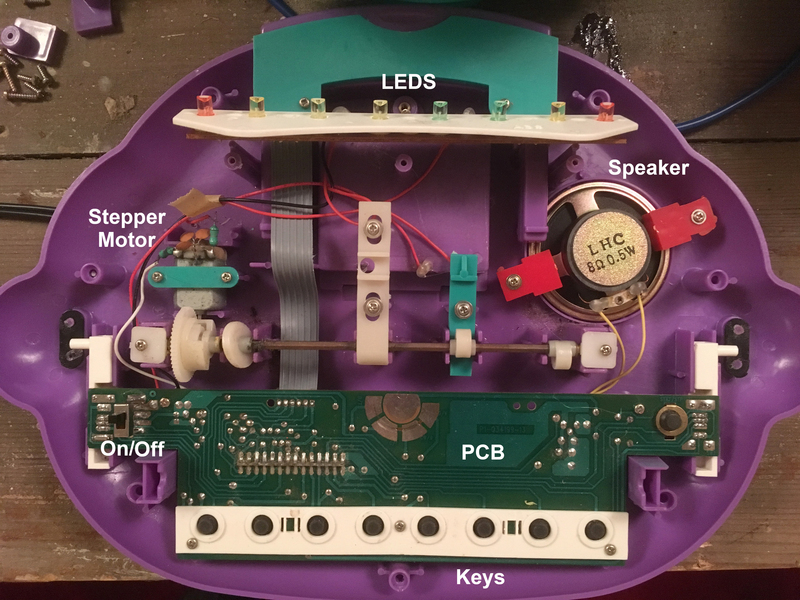 In the centre of the device you can also see the rod by which the stepper motor moves the figures of the animal band when notes are sounded, and at the bottom the actuators which are pressed by the keys. The first thing I did after opening the case was to give the actuators a clean. 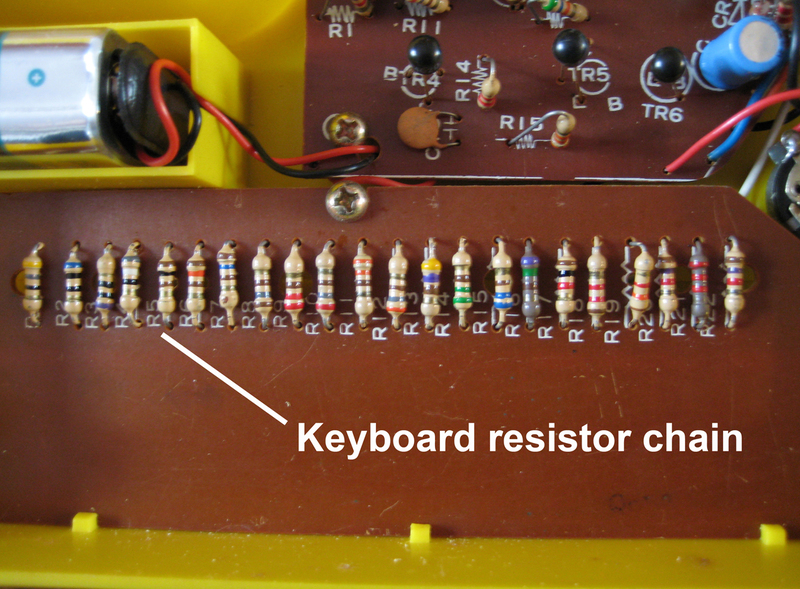 They are the typical type – like computer keyboards or game controllers – which, when pressed, connect together two narrow tracks on the PCB. If dust and dirt get inside them, they can operate erratically. Apart from cleaning these small PCB tracks, I gave the carbon or graphite blocks which make the connection a light scrape to make sure their surfaces were also free of dirt and dust. The point marked ‘Common’ needed to be connected to pin 1 of the 4067, and the 8 notes to first 8 output connections on the 4067. (Actually, output 1, pin 8, in the Bigfoot system is not connected, so the unit is silent on receipt of 0000. 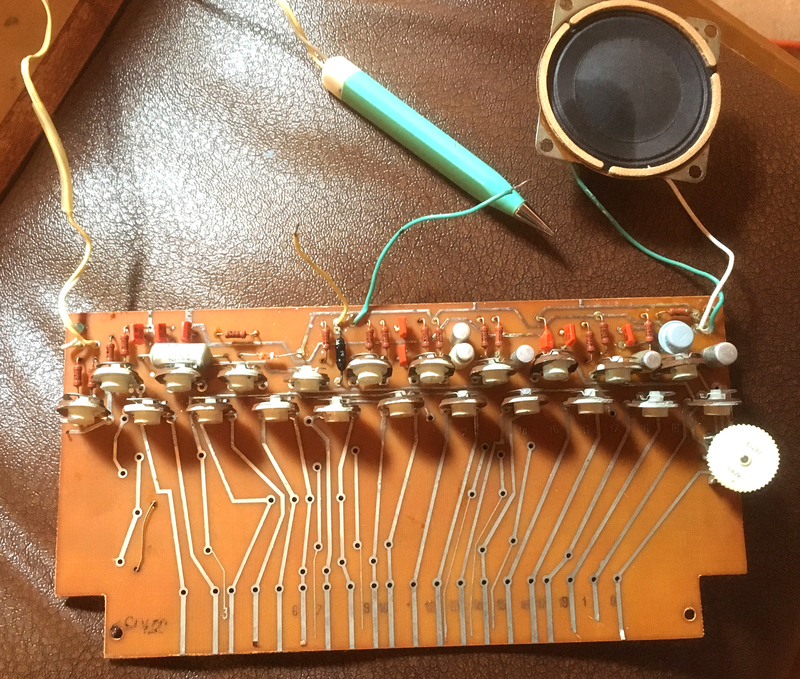 The first note sounded is 0001, so the outputs used are 2-9, starting with pin 7). In the Bigfoot system, an instrument which can sound all 12 notes in an octave would have switches to raise or lower some notes of the scale (the 2nd, 3rd, 4th, 6th and 7th notes), but the Animal Band and the Telephone are fixed to play a major scale, so these switches aren’t needed. 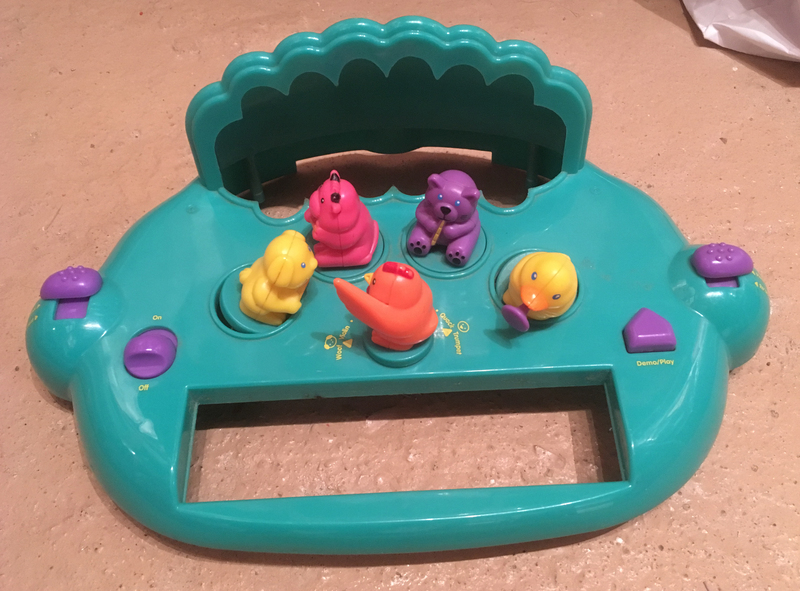 Finally, there needed to be a circuit to connect the Animal Band and The Telephone. This would have to combine the input from Bigfoot, the Chessboard (or other 4-bit binary input) and send this in binary form to The Telephone. 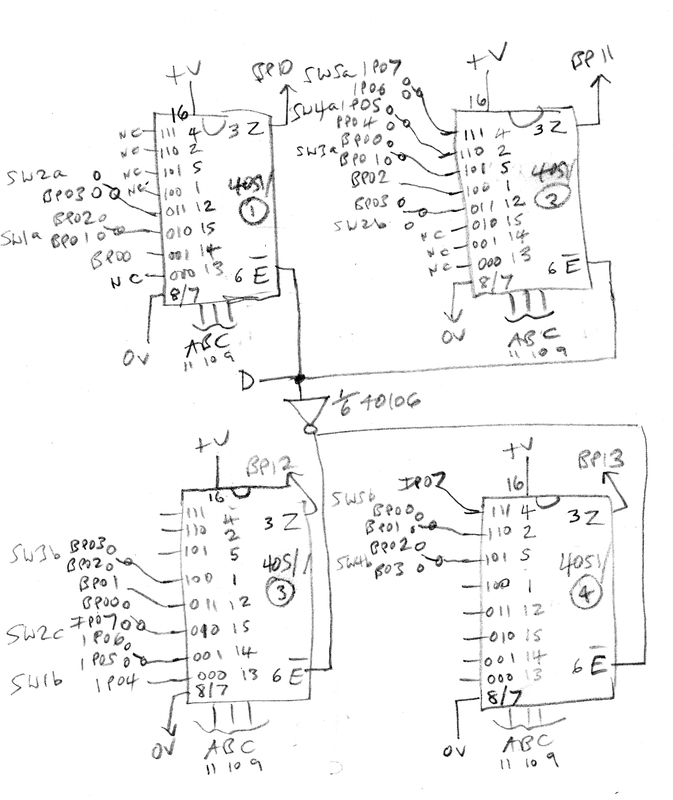 This consisted only of inputs from two DIN sockets, entering via diodes, and passing through a second 4050 buffer. The large 24 pin chip at the bottom left is the 4067; the two chips above are the input and output 4050 buffers; the other 3 chips are two 4532’s and a 4071 for the unused binary-converting ‘Send’ circuit. 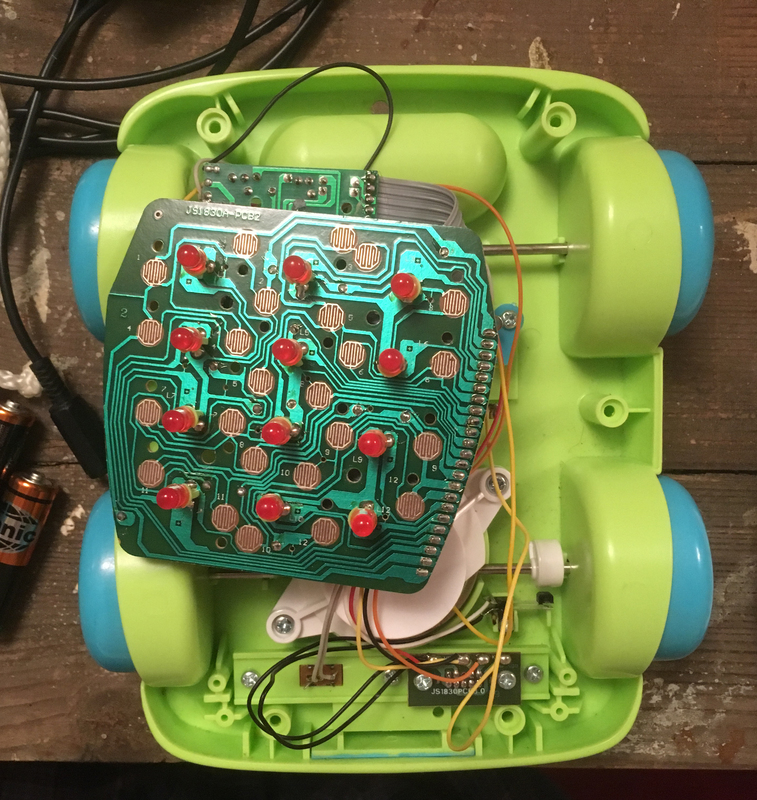 The diodes in the bottom right are for the inputs from Bigfoot and the Chessboard. 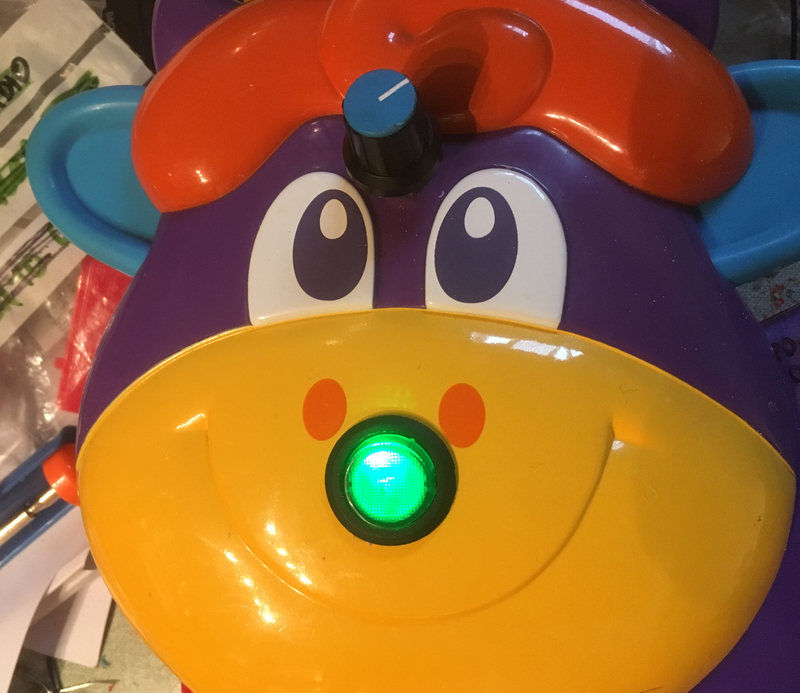 The board was designed to fit into the rear section of the Animal Band, behind the ‘organ pipe’ section with the LEDs in it. I added 6 extra LEDs here, connected to the 6 outputs of the 4050 input buffer. Most of the connections – including the 6 new LEDs – can be seen in this view of the inside, just before putting the case back together. This picture shows 3 of the new sockets and switches. 1 = the 5-pin DIN Out socket; 2 = the 4067 Enable/Inhibit switch; 3 = the audio out socket. 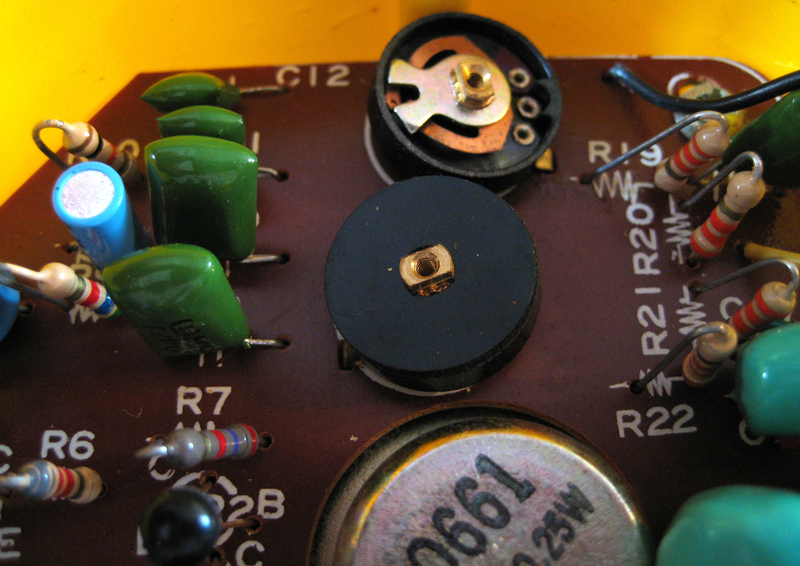 When a 3.5mm plug is inserted into the socket, the speaker connection is cut out. The Telephone needed a similar circuit. 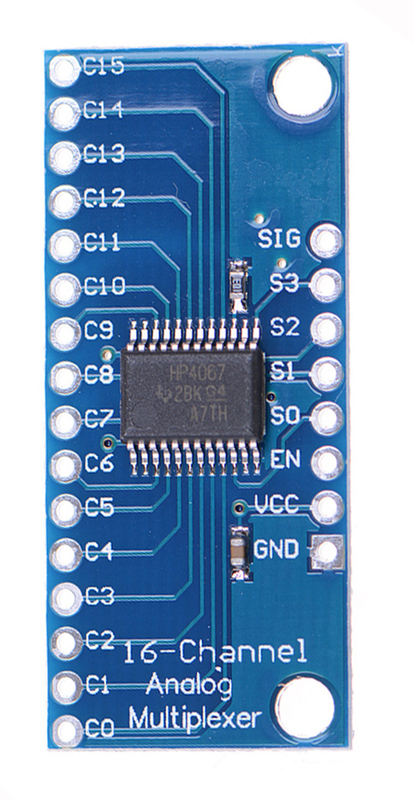 The 4067 is one of my favourite chips, and I’ve been using it for some years, but recently, it seems , the Arduino hobbyists have started to use it, as there is now a reasonably-priced breakout board available, using an SMD version of the chip. This looked like a real time-saver for me, so I bought a stack of them – at a cost of about 70p each – and The Telephone was my first chance to use one. As can be seen, the 16 outputs are brought out on the left-hand side of the board, and on the right-hand side are ‘SIG’, which is the Common output on pin 1; the 4 binary inputs S0-S3; ‘EN’, the Enable or Inhibit pin; +v and Ground. 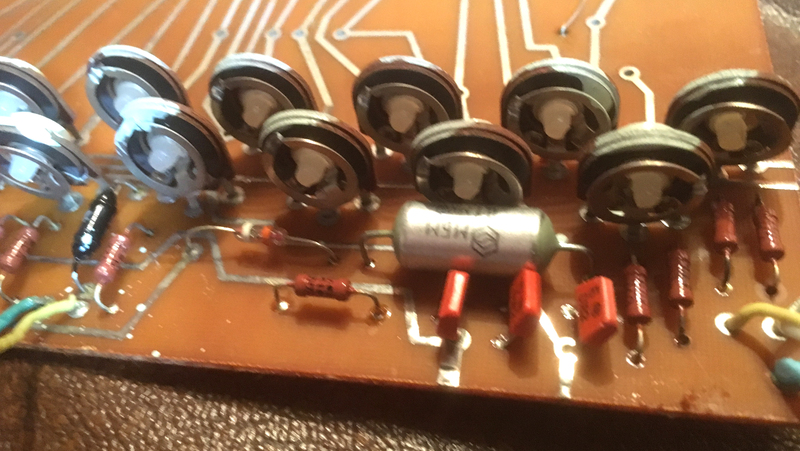 I couldn’t use this breakout board in every situation: the information with it said the maximum voltage should be no more than 7v – elsewhere I have even seen 6v. I think the intention is that it would be used with 5v, like the Arduino, but in any event the 4.5v I was planning to use with the Animal Band and Telephone would be well within the limits. 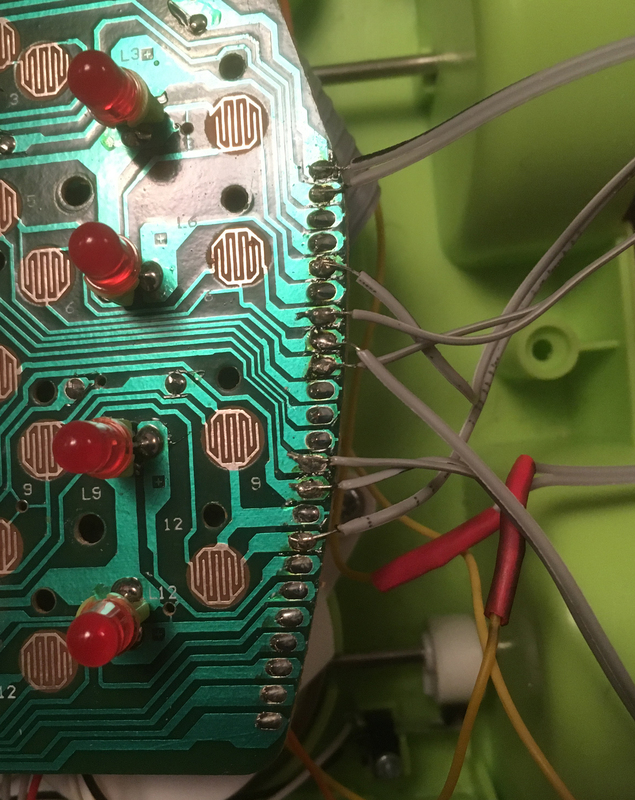 The main circuit board inside The Telephone sits under the 12 buttons of the keypad. It looked as though the important connections were down the right-hand side of the board, so, tracing the tracks, it was possible to work out which ones needed to be connected to produce each of the notes The Telephone was capable of. Track 8 was the ‘Common’. This track needed to be connected to one of 8 of the other tracks to produce the notes of the scale. I identified which 8 tracks these were and connected these, plus the Common, to the 4067. As with the Animal Band I connected outputs 9 – 15 to outputs 2 -8 to make sure The Telephone would be constantly sounding – except when in receipt of a 0000 input. 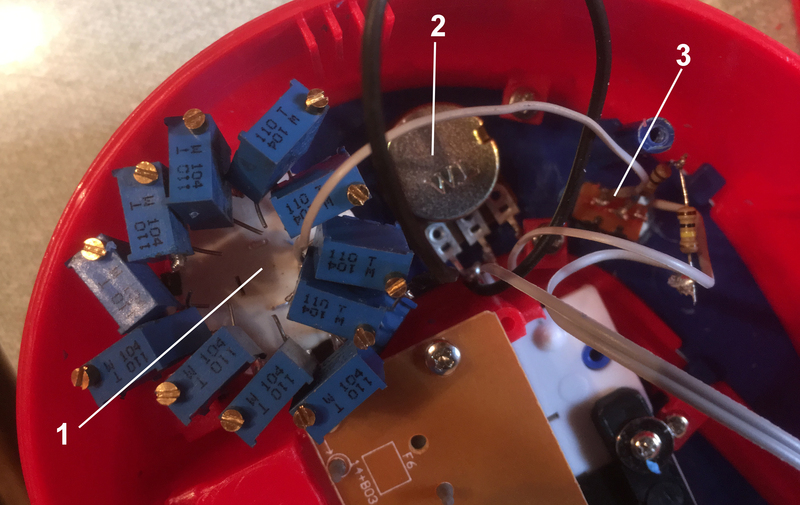 According to the circuit diagram of the module, it appeared that the Inhibit or Enable pin was tied to Ground with a 10k resistor, so the unit would automatically be working when the power was switched on. This meant that only a SPST switch would be required to connect the pin to +v if it was necessary to stop it functioning. 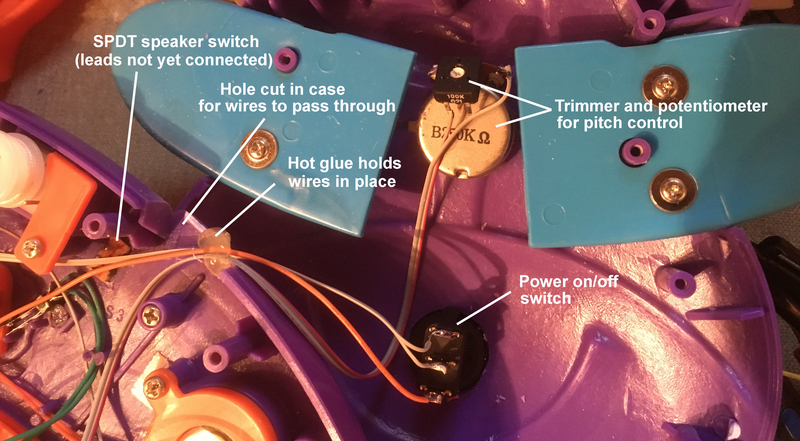 Also visible in this picture are the four 100k resistors connecting the inputs of the 4050 to ground, and the audio out socket, which cuts out the internal speaker when a 3.5mm mono plug is inserted. 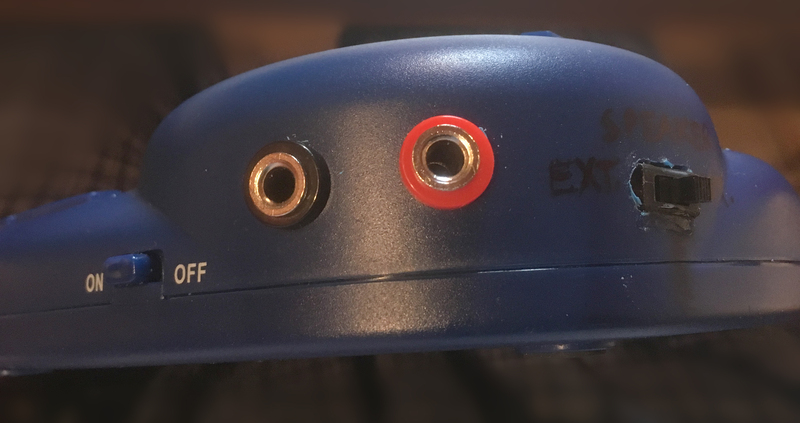 The only other thing to add was a switch attached to the enable/inhibit pin of the 4067 to allow the unit to be switched off without removing the power. 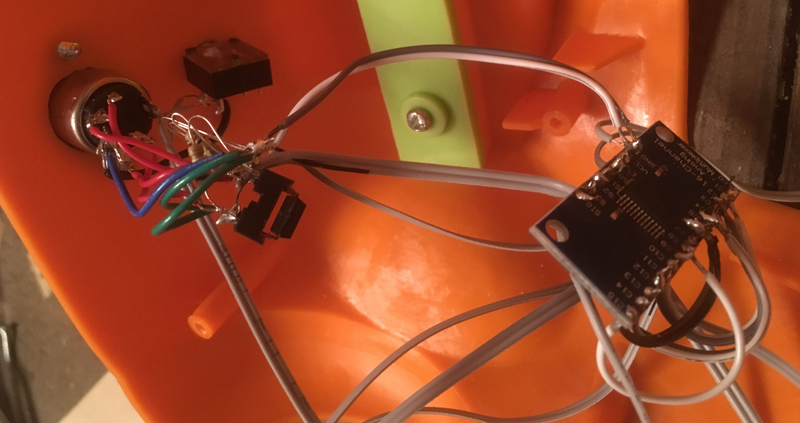 As mentioned above, the enable/inhibit was attached to ground internally in the module, so the switch just required a connection to +v, which would stop the 4067 from functioning. 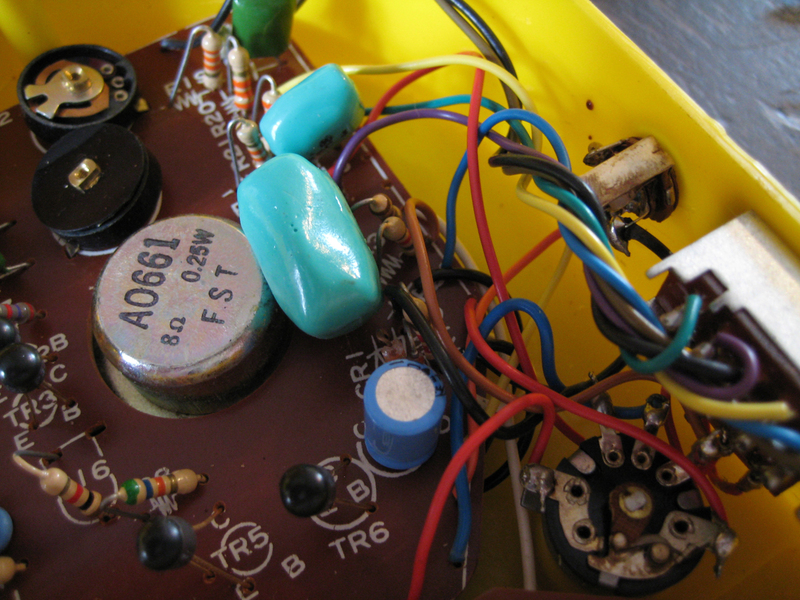 On the rear can be seen the audio out (top) and 5-pin DIN (bottom) which can accept input from the Bigfoot sequencer, or a device compatible with the Bigfoot 4-bit binary note system (e.g. the Chessboard keyboard). Everything seemed to work as expected, and the two units played in unison – or individually if one or other of the enable/inhibit switches were turned off – when operated either by the Bigfoot or the Chessboard. Click here for a short film of the set-up taken on my iPhone. There are a number of different instruments called the ‘Melophone’ or ‘Mellophone’. The one on the left in the picture below (by Kc8dis at the English language Wikipedia) is a brass instrument used in marching bands and the one on the right is ‘a cross between a guitar and a harmonium’, according to the Squeezytunes blog (at http://squeezyboy.blogs.com/squeezytunes/2008/02/melophone.html, from which the pictures came). 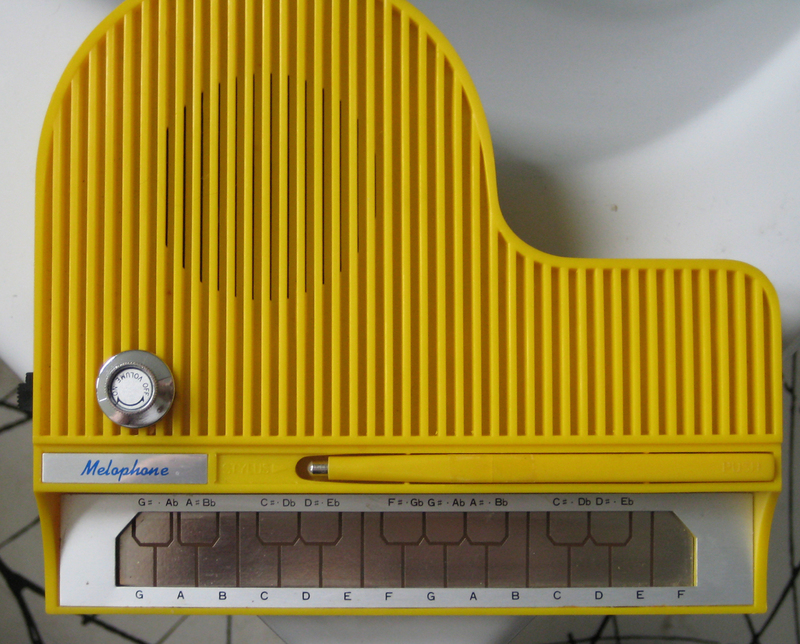 However, this Melophone which I recently acquired, is clearly a type of Stylophone – and a very stylish type of Stylophone at that! I had never heard of this Melophone before, and found only a single reference to it on the internet. A glance at the accompanying booklet – which, as you will see below, follows exactly the same style and format as the booklet from a 1960s/70s Stylophone – shows that it was not written by a native English speaker. The company that manufactured it is (according to this website: http://www.pewc.com.tw/eng/) or was (according to this Wikipedia entry: https://en.wikipedia.org/wiki/Taiwan_Mobile) founded in Taiwan in the 1950s and acquired the name ‘Pacific Electric Wire and Cable Company’ on December 30th 1957. 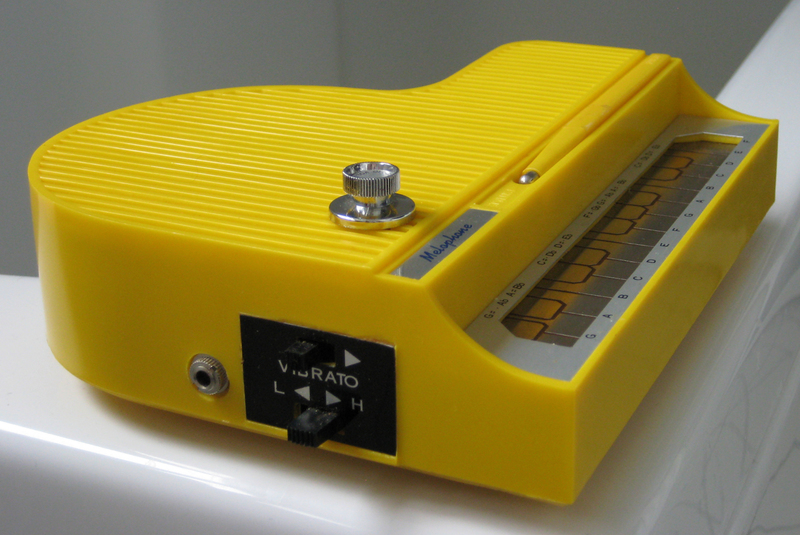 The company would, therefore, have been in place to manufacture the Stylophone after its invention in 1967. 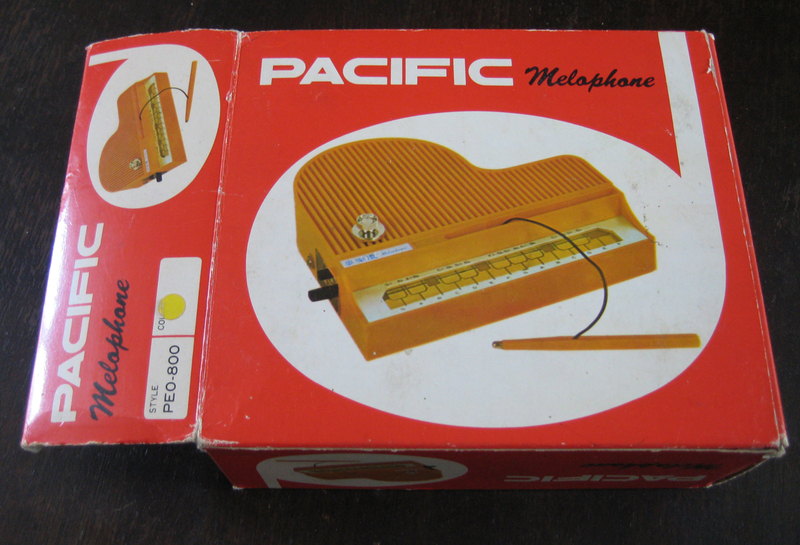 It looks as though it may have done so for some years as the picture on the box shows a Melophone with the early Stylophone keyboard with the black non-playing sections; just as the Stylophone was updated with a new keyboard, so it seems was the Melophone. 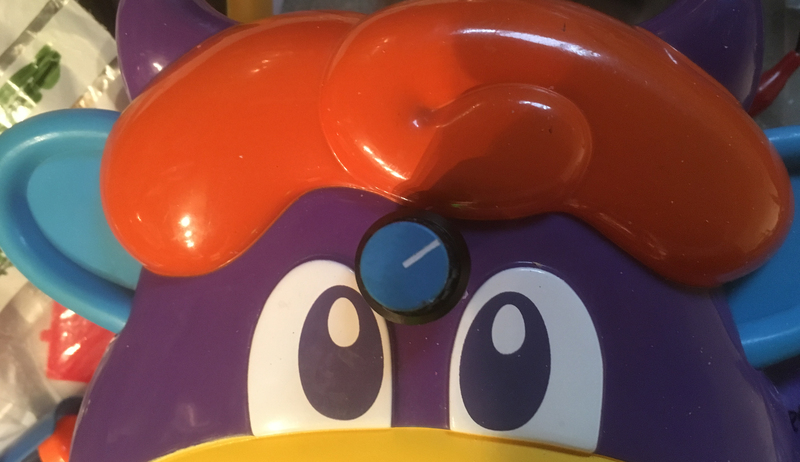 The flap has a sticker on it showing the colour as yellow, which this one is; but other colours were presumably available. It is, incidentally, not ‘Colour’, but ‘Color’, which may be an indication of the market it was intended for: Asia or America. There would be no reason why it should not be intended for the UK, as the legend ‘Made in Taiwan’ was commonly seen during that period – except that genuine, British-made Stylophones were available over here, and Dübreq would surely not want to allow or encourage competition. 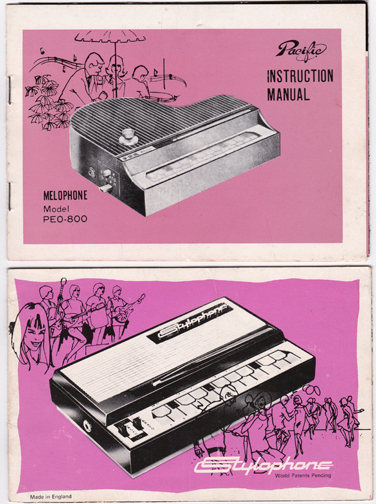 The similarities with the Stylophone – its appearance as well as its booklet – are striking: particularly the distinctively-shaped keyboard with its recess above to hold the stylus. Nevertheless, there are significant differences – aside, of course, from its handsome ‘Grand Piano’ shape! 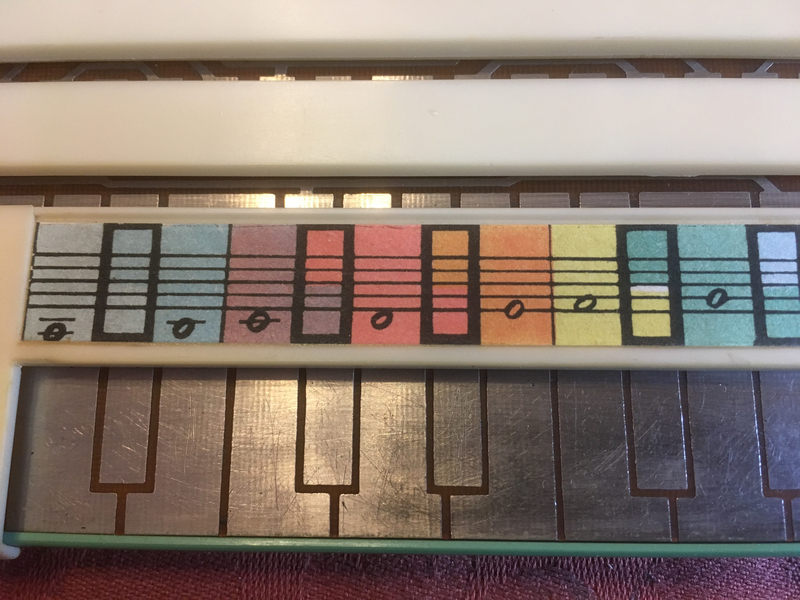 There are 2 extra notes at the bottom end of the keyboard, G and G#, and 1 extra note at the top, F – that is, 23 notes in total, as opposed to the Stylophone’s 20. 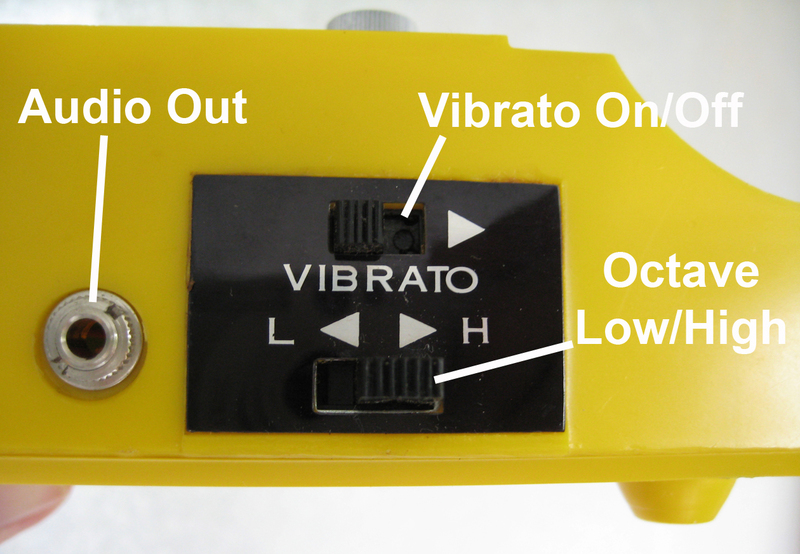 The Vibrato switch is found on the left side, together with a control the standard Stylophone never had – an Octave-change switch! Using this switch, the range of the Melophone can be extended by another 12 notes, giving the instrument an exceptionally wide range. 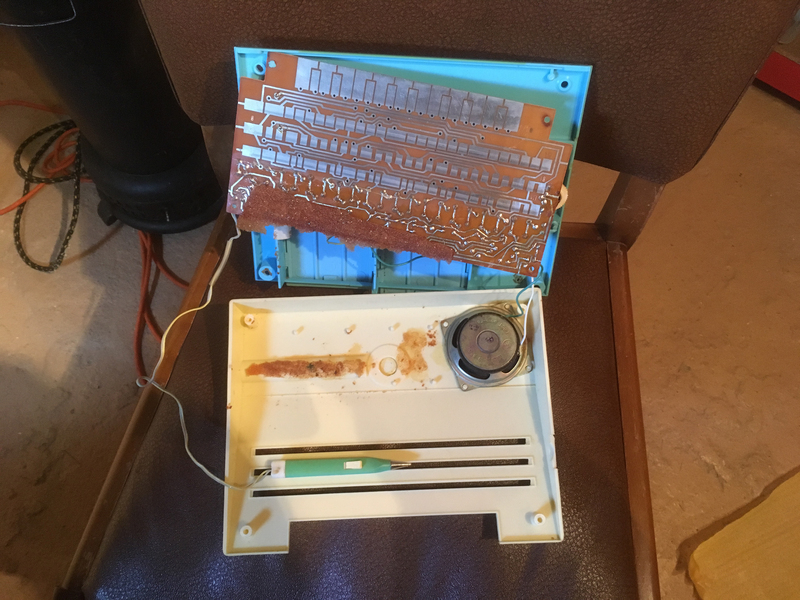 Turning the instrument over reveals the battery compartment – like the original Stylophone, the Melophone requires a 9v PP3 battery – and the three screws which need to be undone to access the inside. 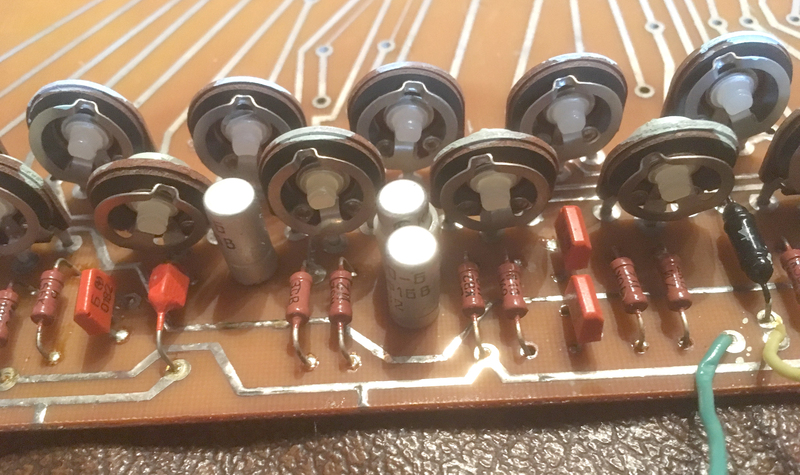 It has no tuning control like the standard Stylophone; I wonder if the top has been removed from one of the potentiometers in the first internal picture in order to make some pitch adjustment. Even the two pieces of music at the back of the booklet are the same: ‘Silent Night’ in the key of Bb and ‘The Londonderry Air’ in the key of C, although references to ‘Stylophone’ or ‘Dübreq’ are noticeably absent. One website (http://www.miniorgan.com/lib/view.php?miniorgan=80&view=E&srch=&srch_type=&sortby=&output=14) pictures and describes as ‘another very cheap STYLOPHONE clone’ an obvious copy (which they date to 1976 – the year after production of the original Stylophone ceased, according to the Stylophone Collectors Information Site at http://www.stylophone.ws/index.html). ‘Sounds poor and very poor plastic’, they say; but this Grand Piano Melophone seems like a step up from that, in sound and construction. Sufficiently Stylophone-like, I’m sure you’ll agree! 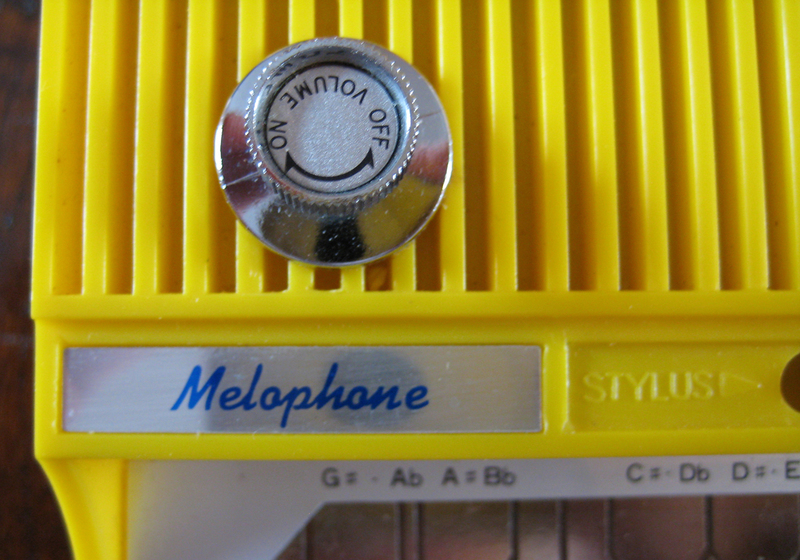 The two low notes beneath the Stylophone’s normal lowest note don’t come out too well, though. I’ll have to see if something can be done about that. Describing a Hong Kong made Stylophone, the Stylophone Collectors Information Site says ‘Problems were experienced by the Dübreq company regarding patent infringments, but licences were apparently also granted, so it is very difficult to categorise this particular model.’ Perhaps the same can be said for the Melophone: it definitely isn’t a Stylophone, but it seems to me reasonably built and with some very close similarities – was it somehow produced under licence, or just a clever copy? If anyone has any further information, please let me know.